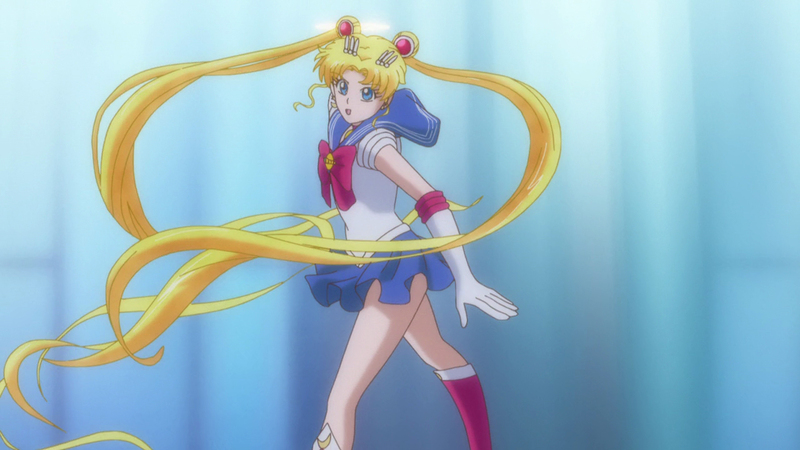 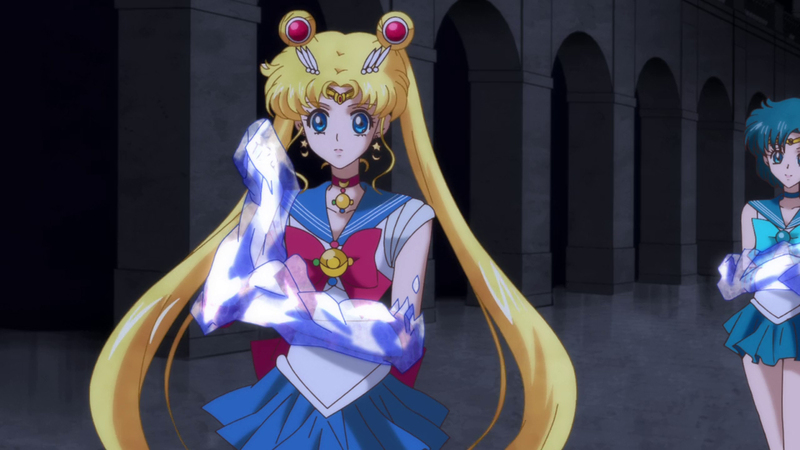 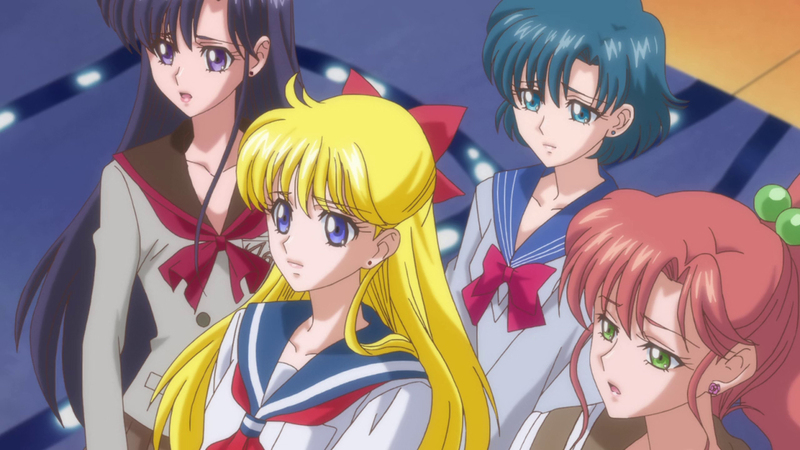 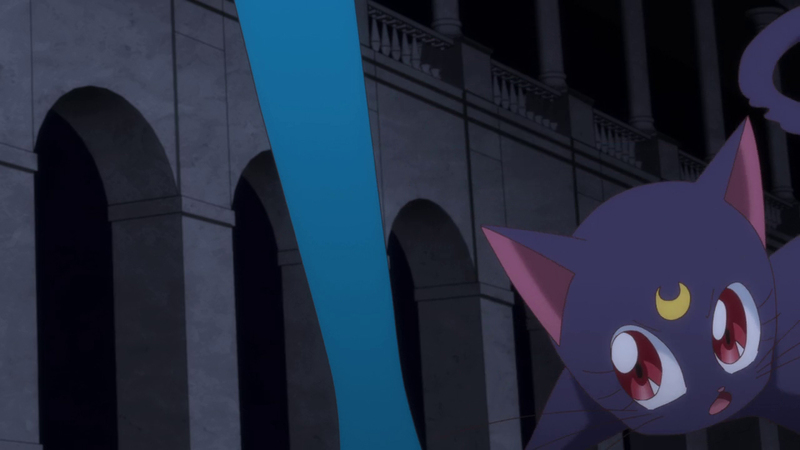 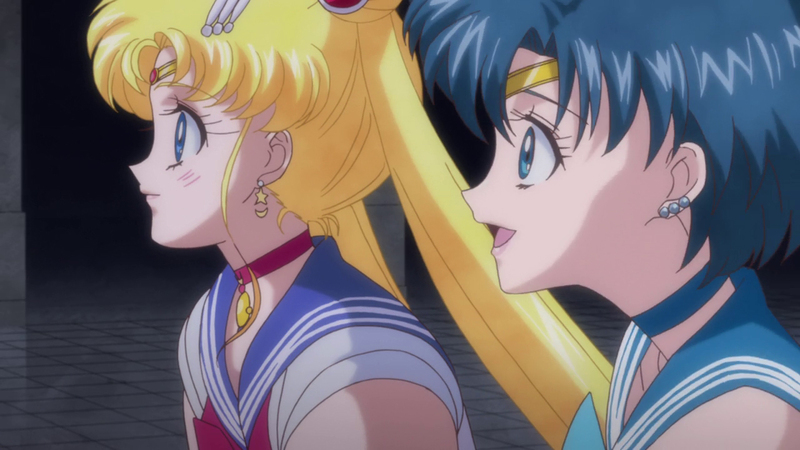 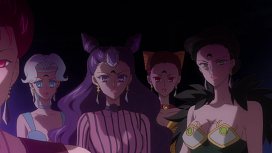 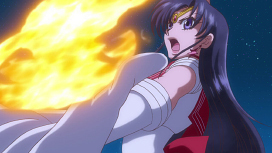 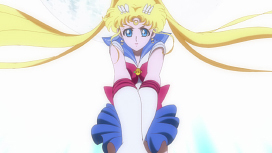 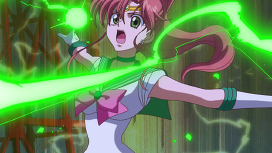 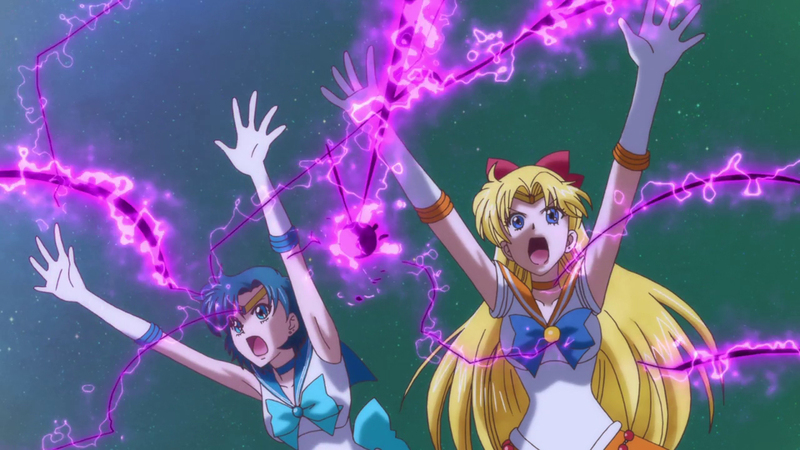 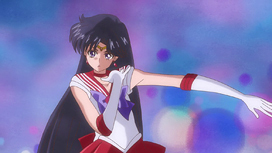 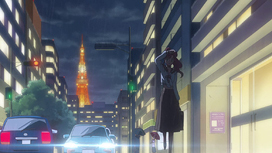 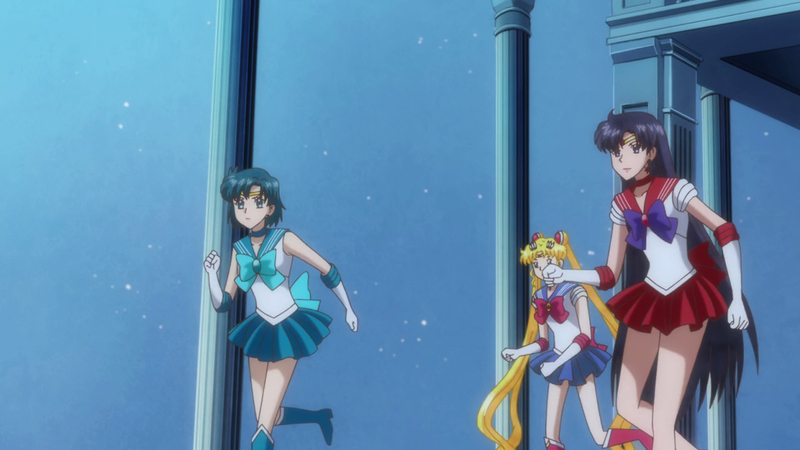 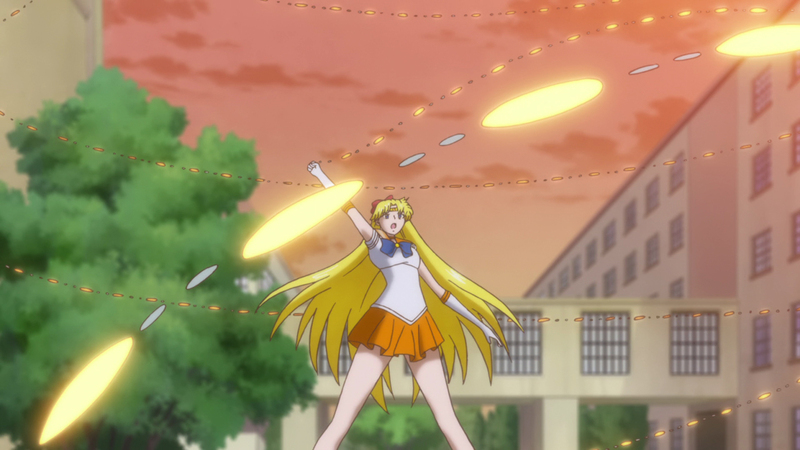 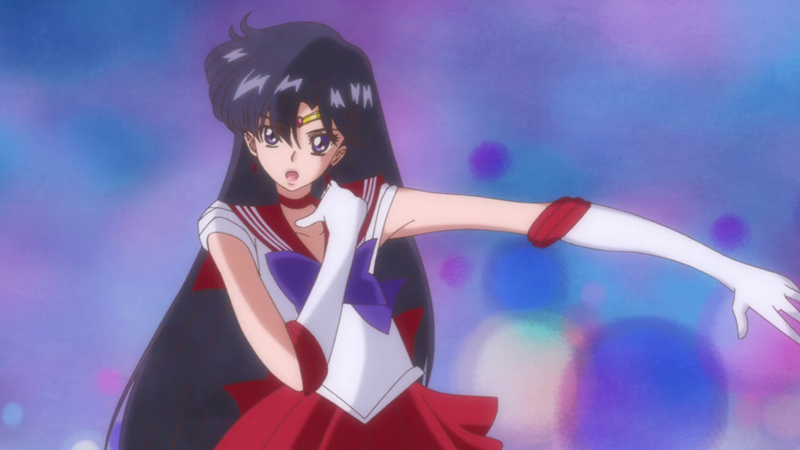 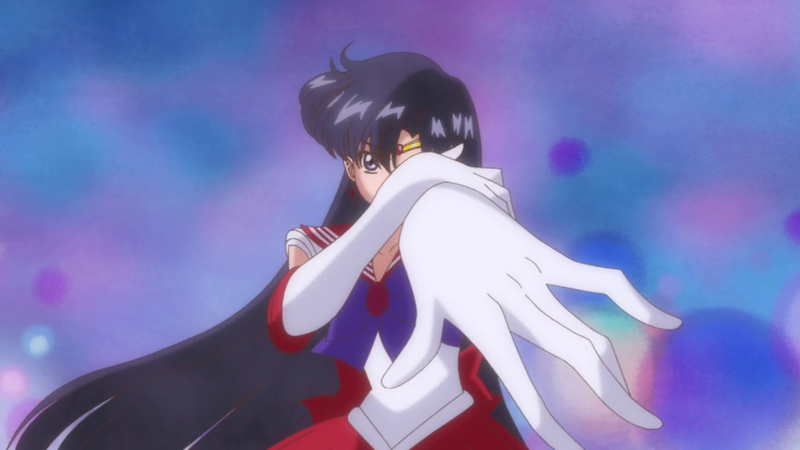 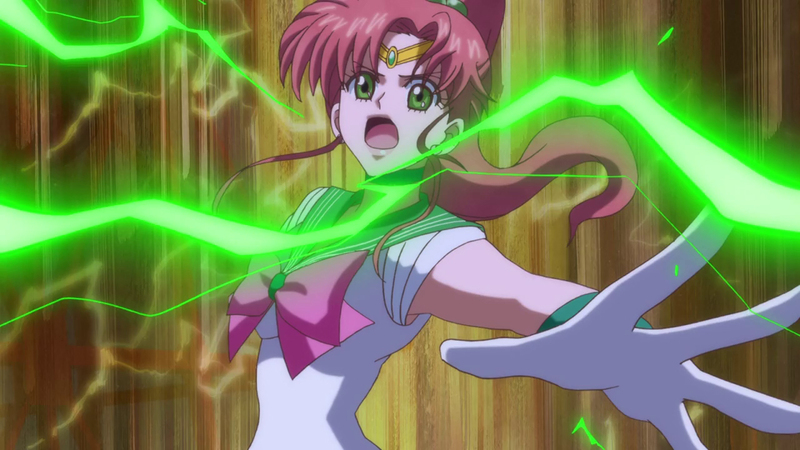 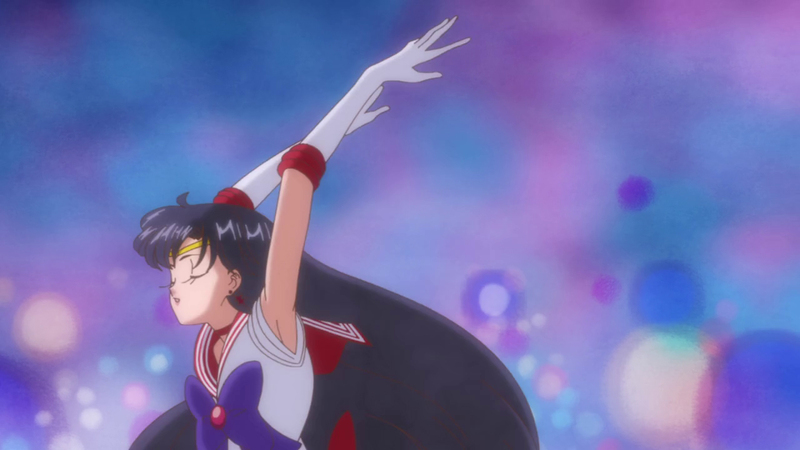 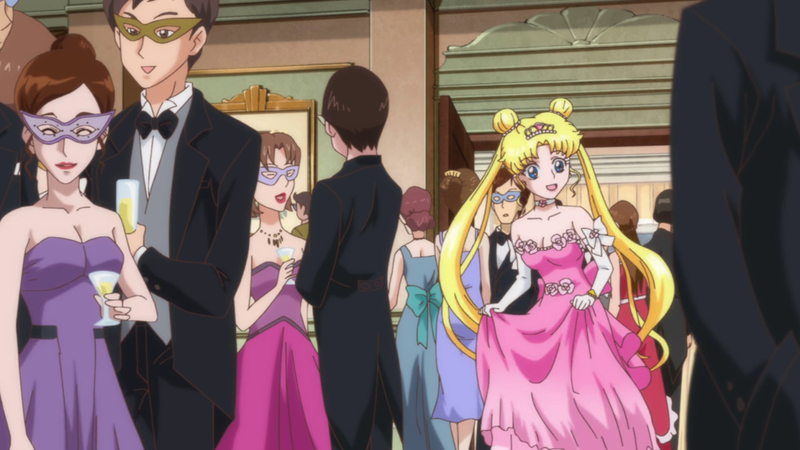 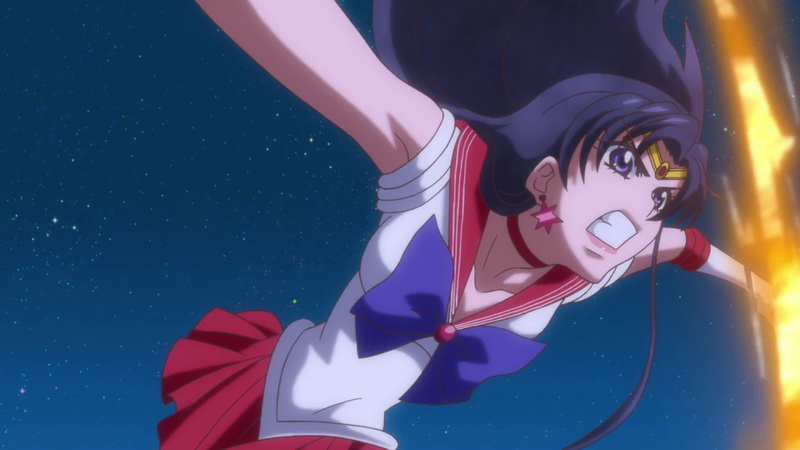 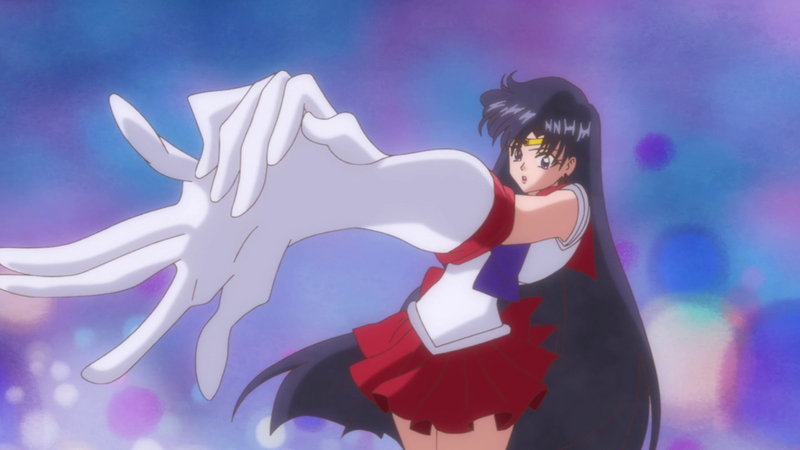 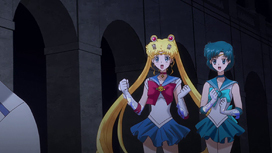 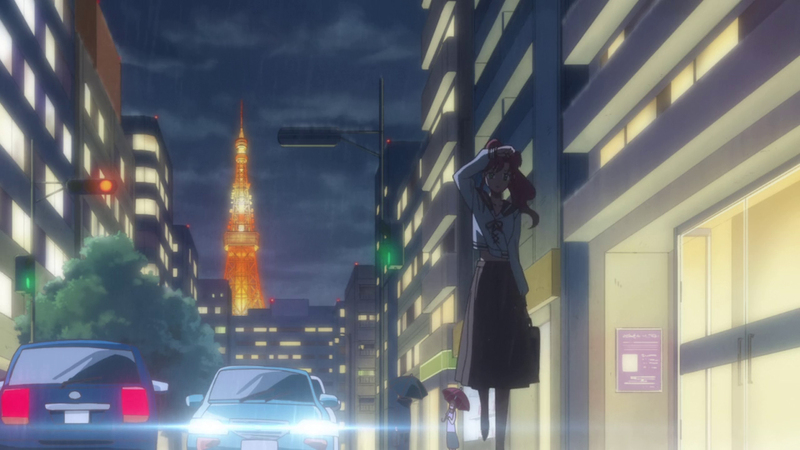 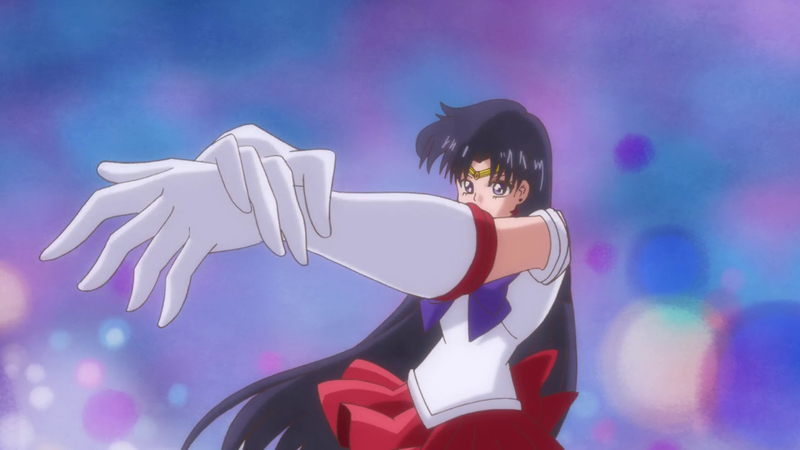 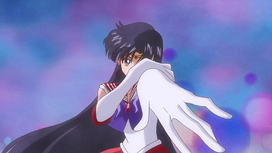 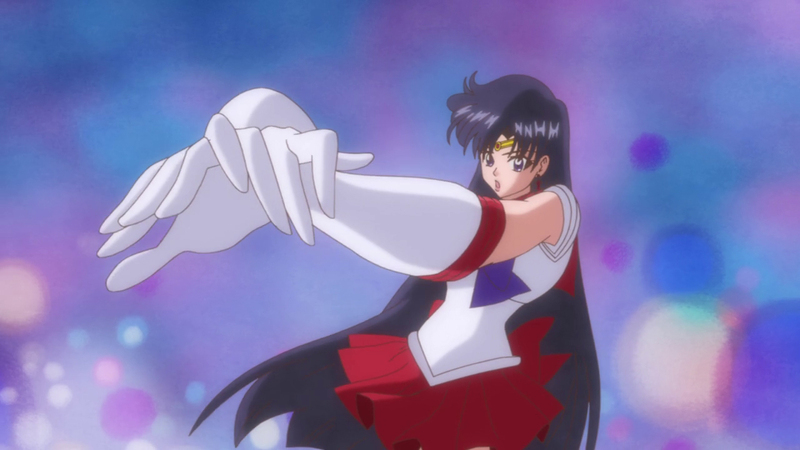 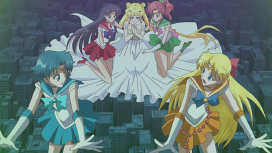 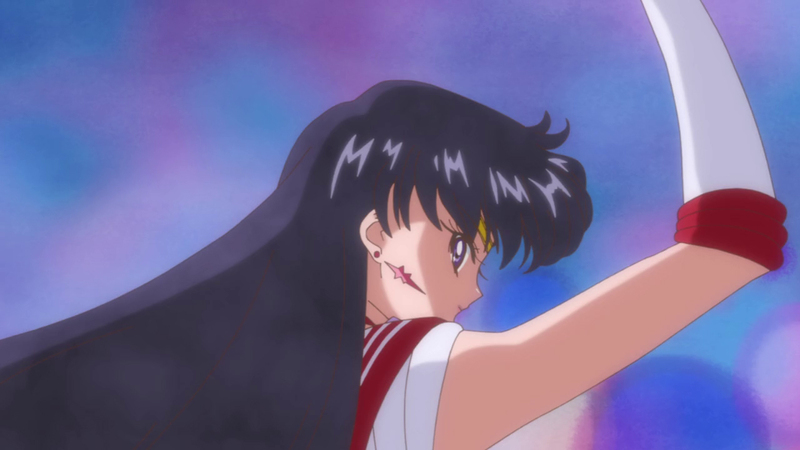 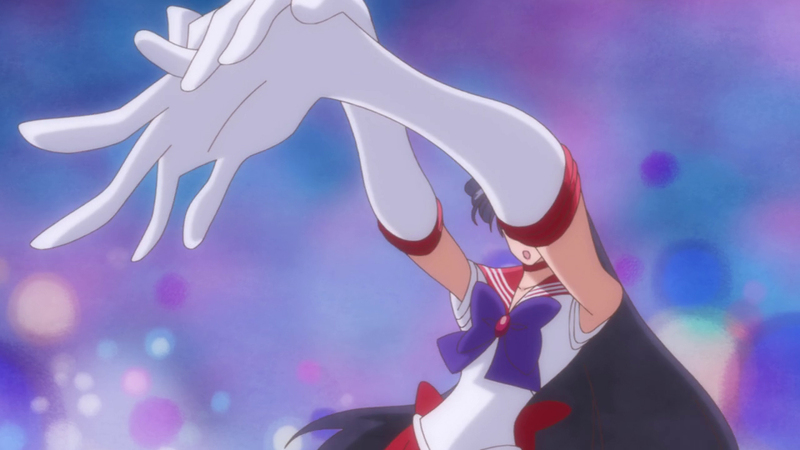 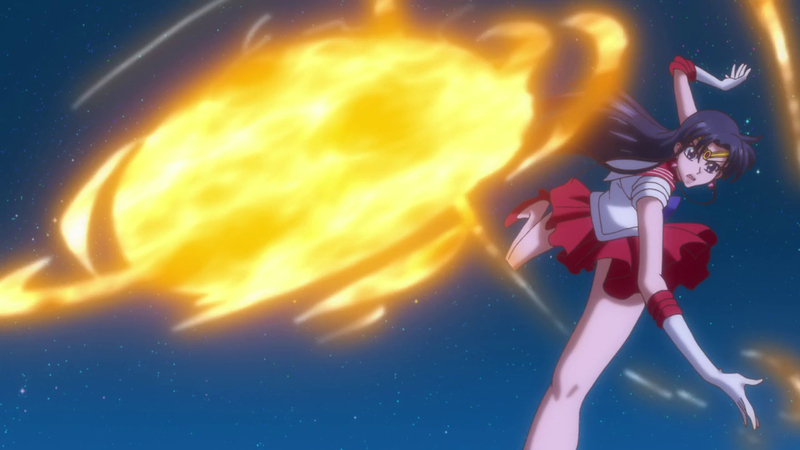 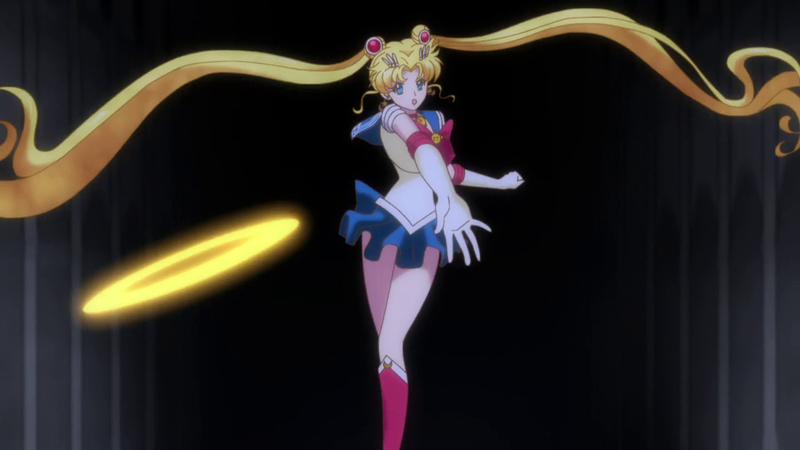 Animation errors in Sailor Moon Crystal. 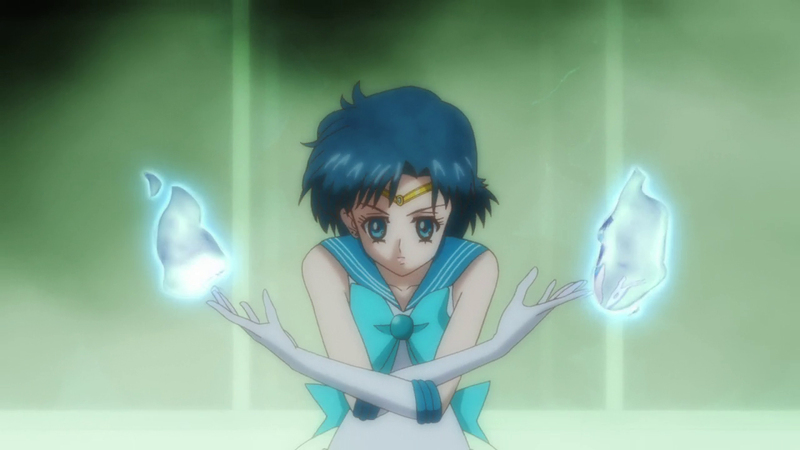 These are for the BluRay version. 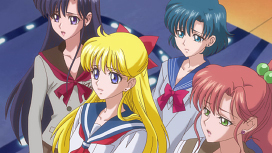 Errors marked with BD-only did not appear in the original web animation. 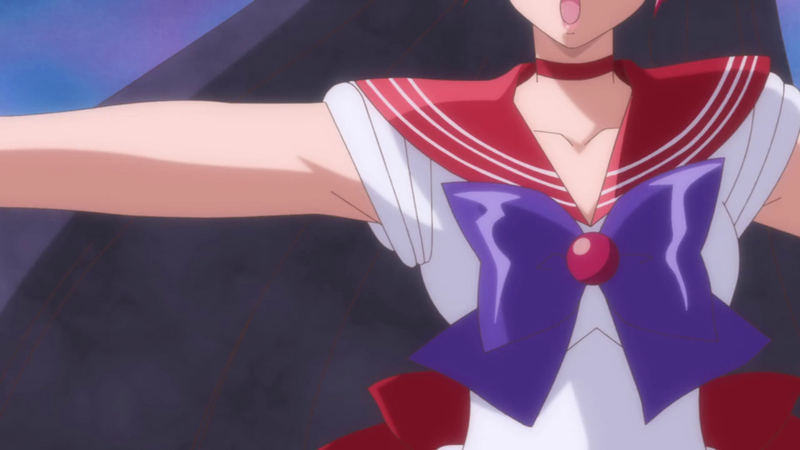 The back bow lines are overlapping the hair, and there is something strange going on with her right arm where the hair parts. 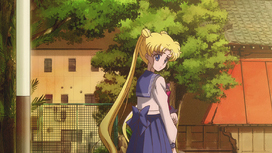 Her back bow vanishes briefly. 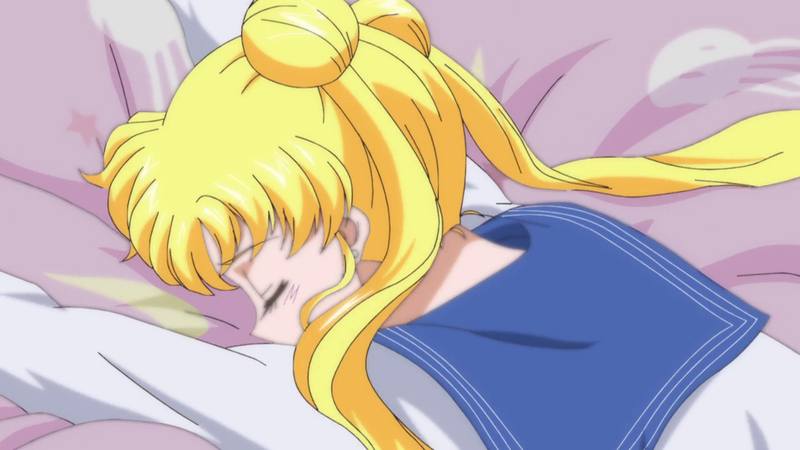 During ep. 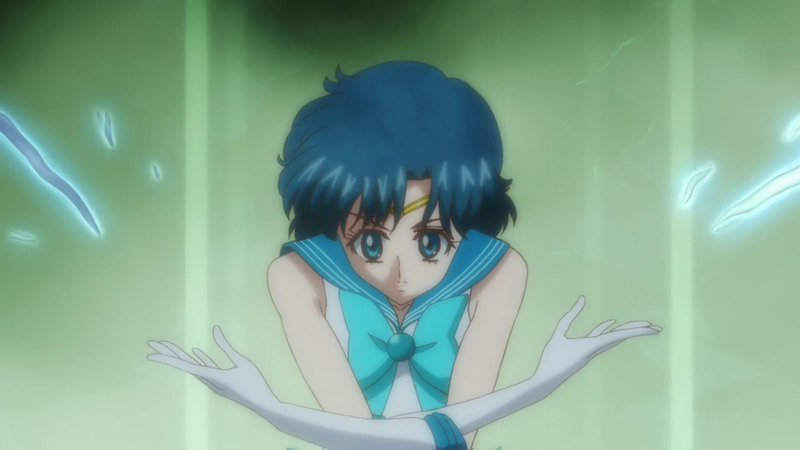 03, her back bow is at one point blue instead of pink. One of her skirt's pleats isn't drawn in and colored correctly. 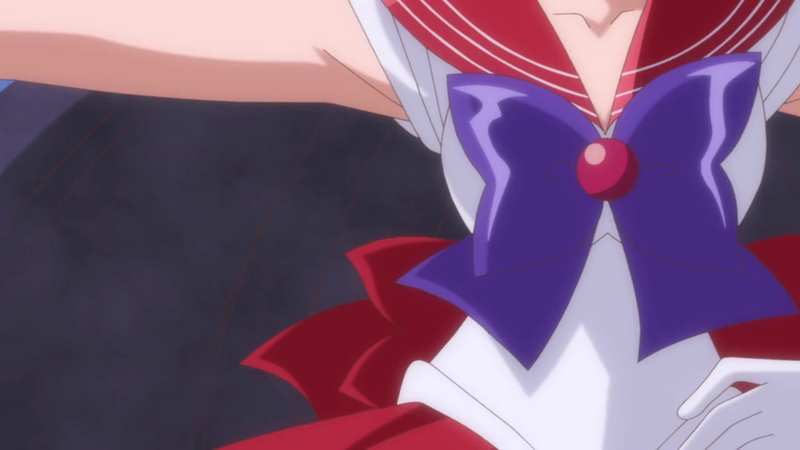 Part of her back bow is not colored in. BD-only error. Her back bow is missing. 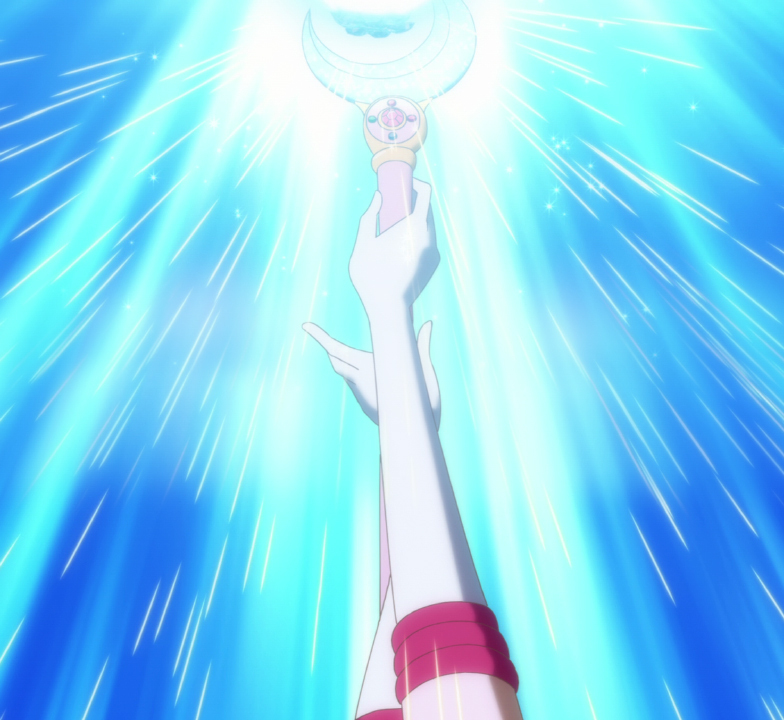 It returns in the next frame, to disappear right after again. 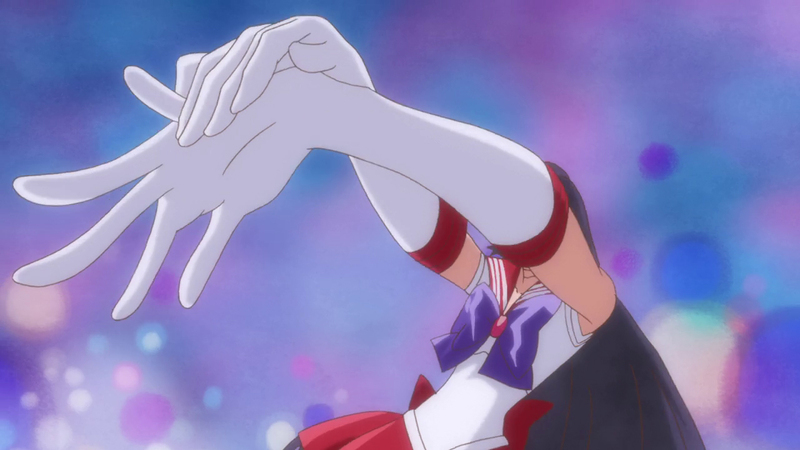 BD-only error. 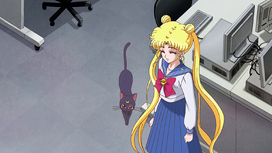 Her back bow is missing. BD-only error. Her choker and back bow are missing. 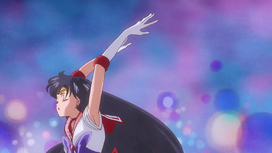 BD-only error. 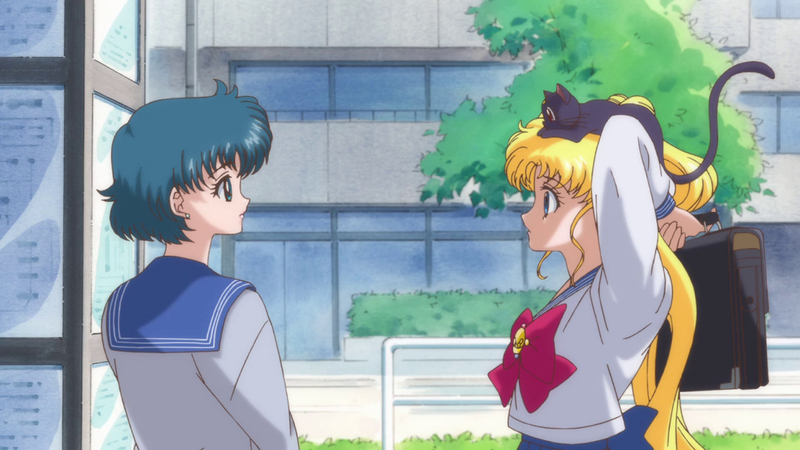 Her back collar has a strange white part. 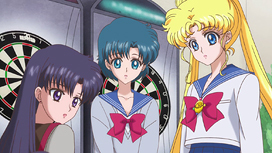 BD-only error. A piece of her back bow is white. 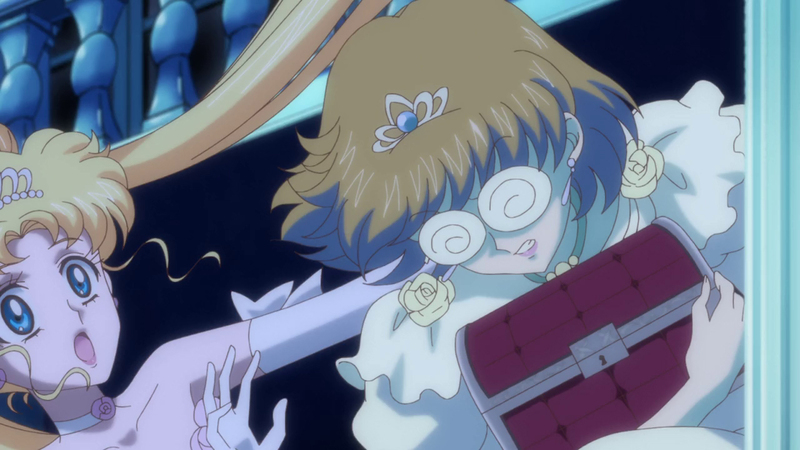 BD-only error. 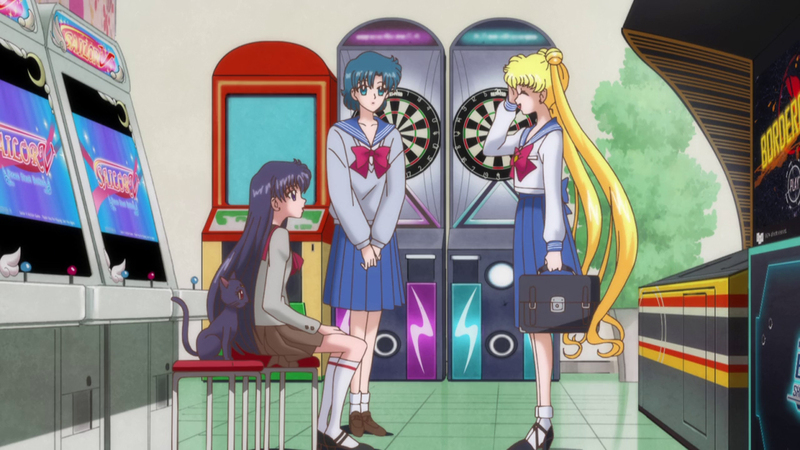 Her back bow is missing from this frame, and the 4 previous frames. It returns in the frame after this one. 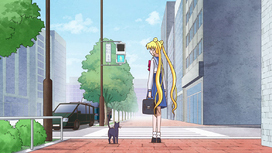 BD-only error. The back of her collar is the same color as her hair. 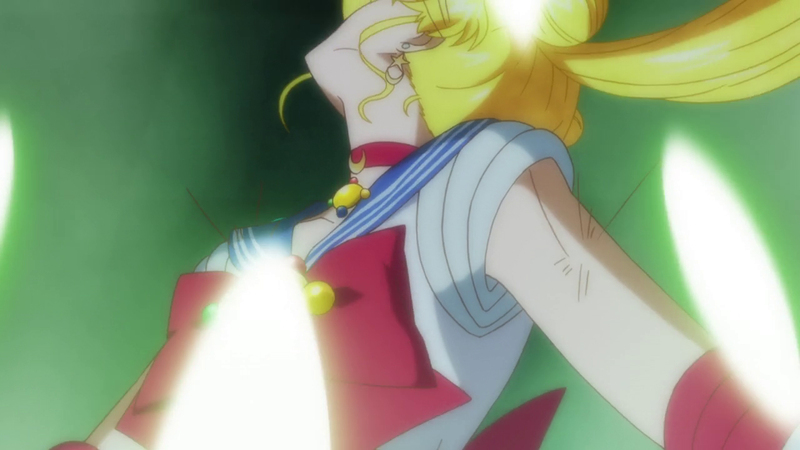 BD-only error. 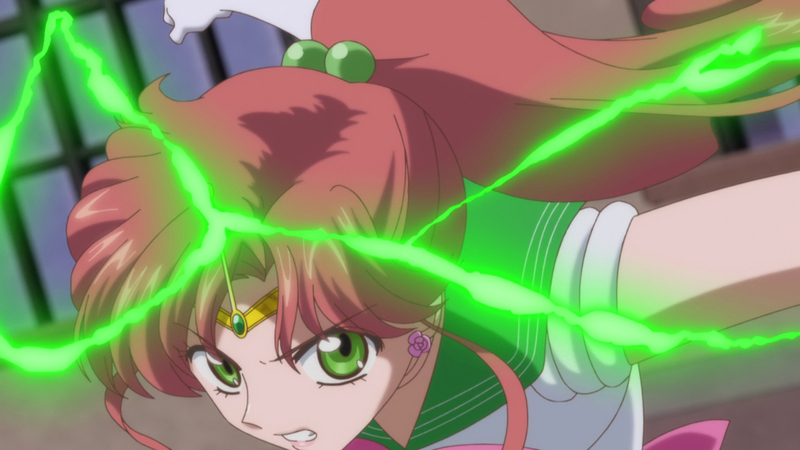 Her collar is white instead of red. Also, very questionable anatomy. BD-only error. 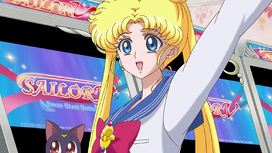 Her choker is missing again. 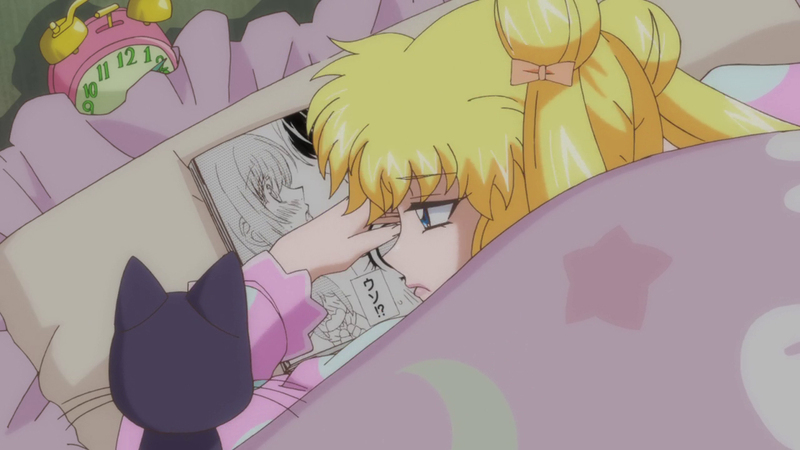 BD-only error. The back of her collar is colored with solid white. 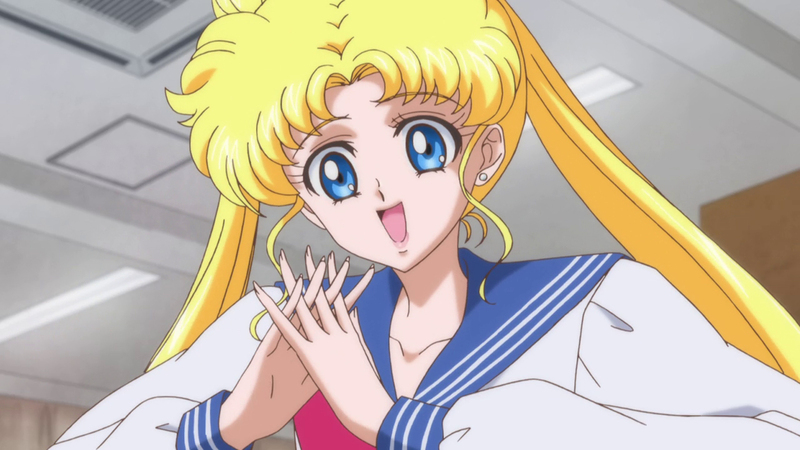 There's lineart going through one of Usagi's fingers. 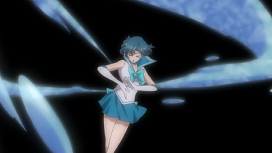 Her hair cuts off part of her clothing. 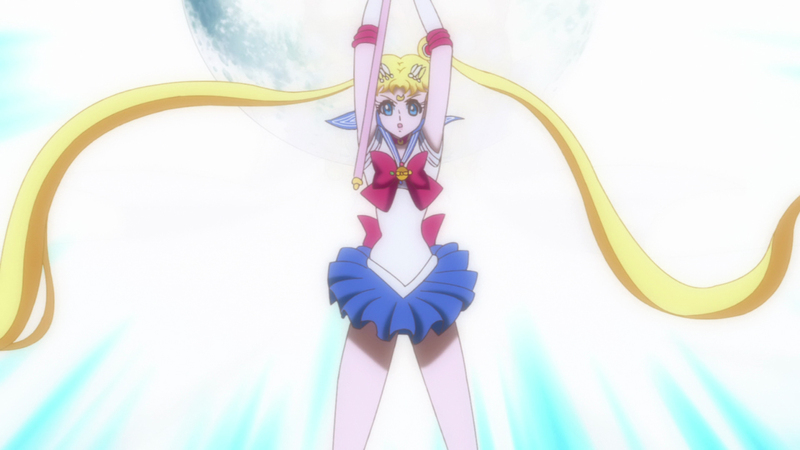 Her leg is amputated and she's holding her cut off foot. 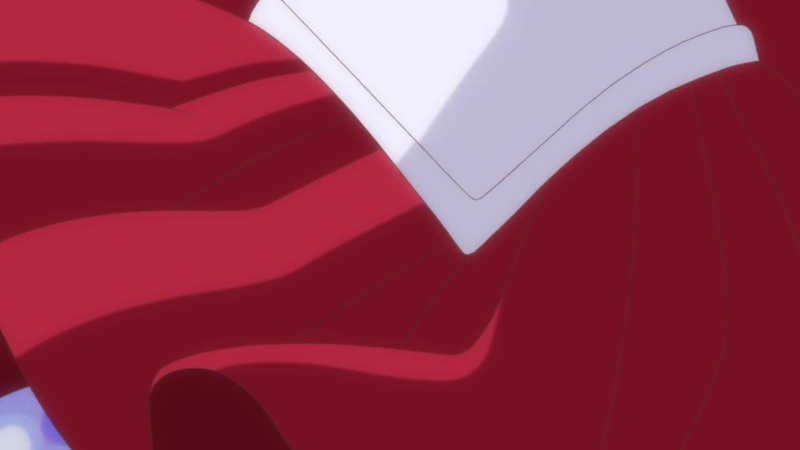 Her skirt is defying gravity. 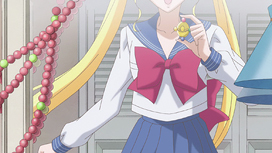 The bottom of the bag disappears and reappears randomly, and her chest bow appears out of nowhere at the end. 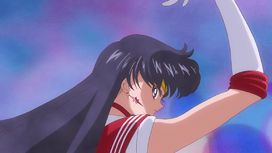 There's a piece cut out from her bangs on the left side. Her back bow is pink instead of blue. 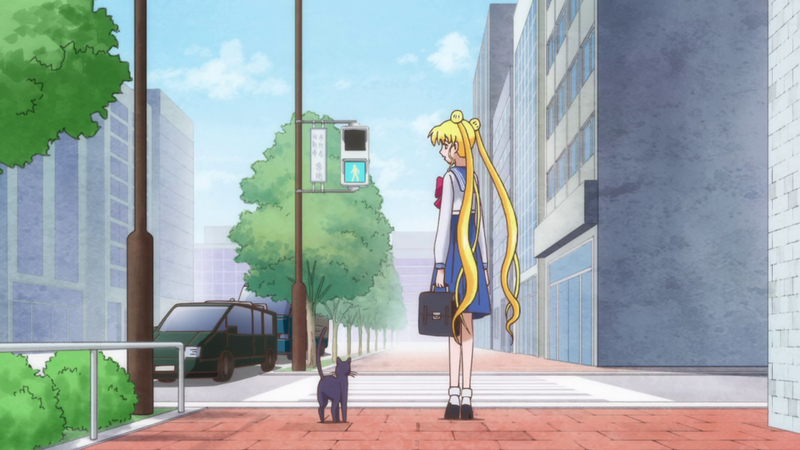 The back of her collar is defying gravity. 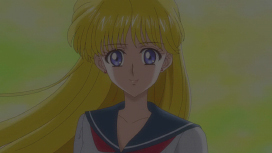 On the left side, the hair strand has a strange cut out part. 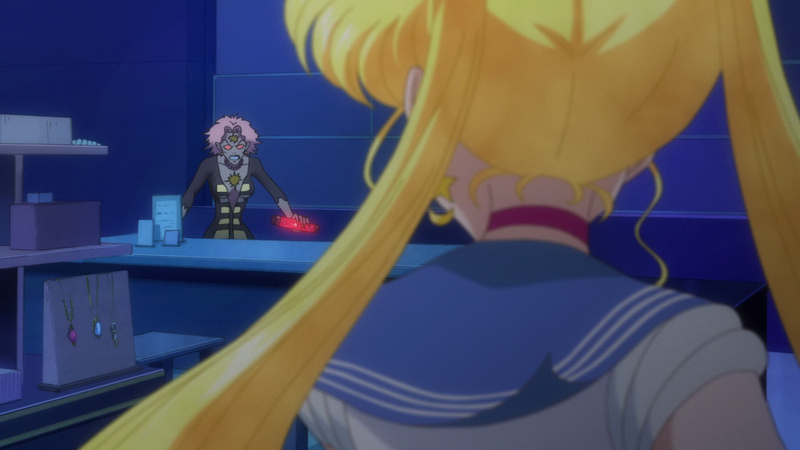 The lineart jitters a little during this scene. 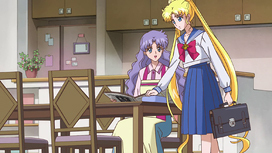 This scene contains multiple errors. 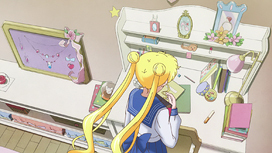 Usagi becomes blurred, the bunny on her bedsheet turns pink plus the collar stripes aren't completely drawn in, there's coloring outside the lines, the shading under her right pigtail vanishes, and part of the shading for the bedsheet goes into her hair. 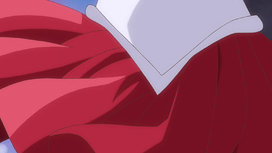 There's a white line overlapping the stripes on the collar on the left side. 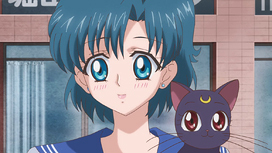 Although Ami is moving, Luna is kept completely frozen in the same position. BD-only error. 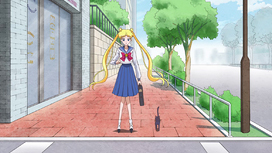 Usagi's back collar disappears as she moves. BD-only error. 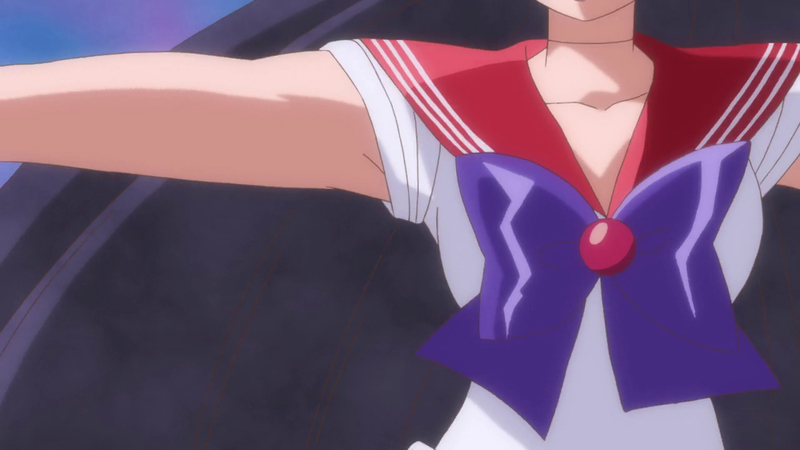 The right side of her chest bow is now abnormally large. 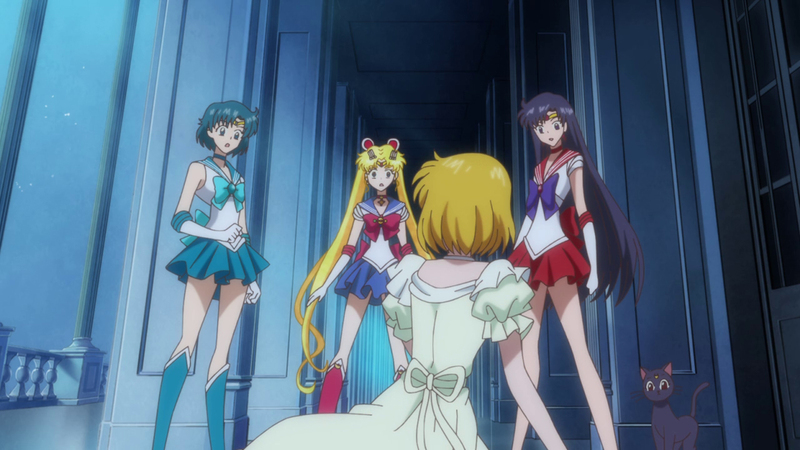 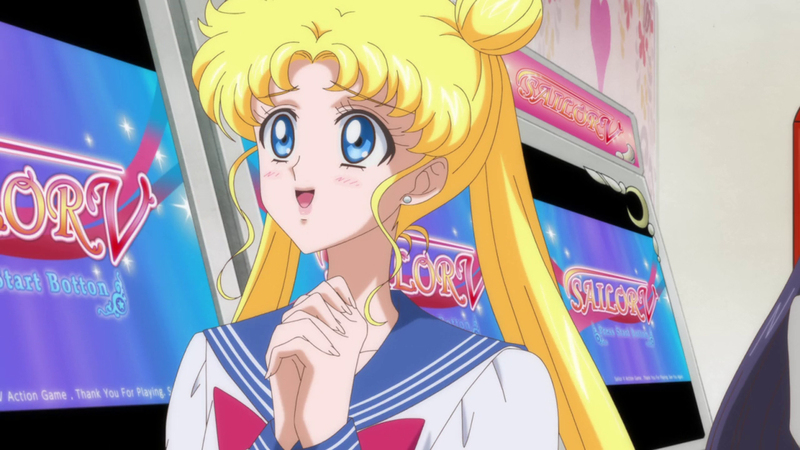 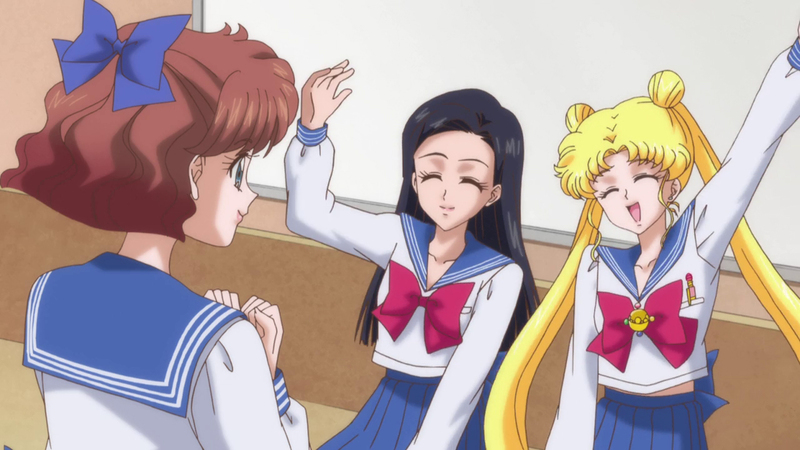 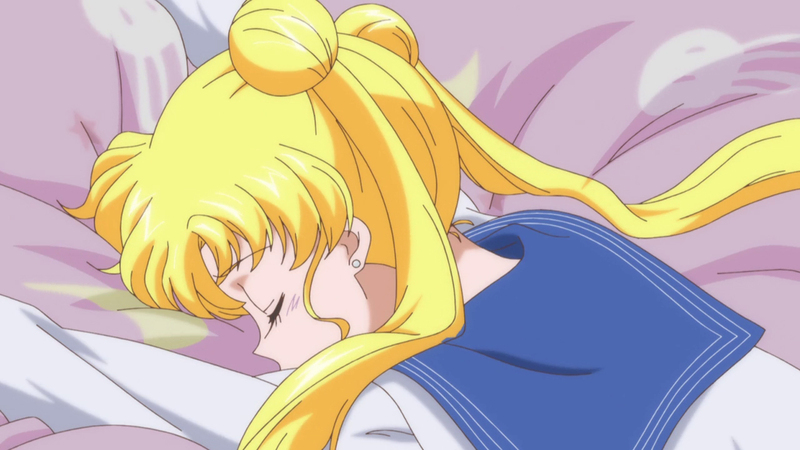 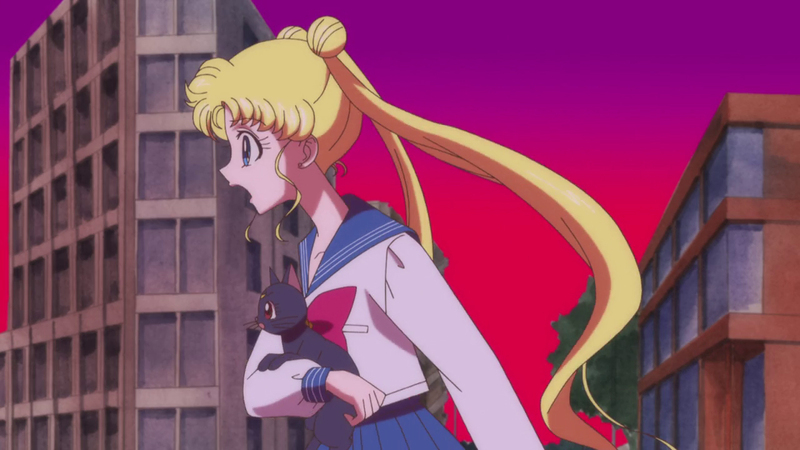 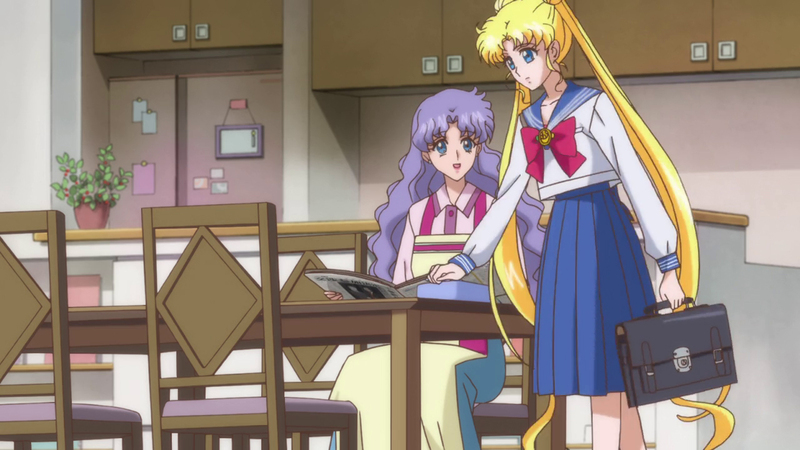 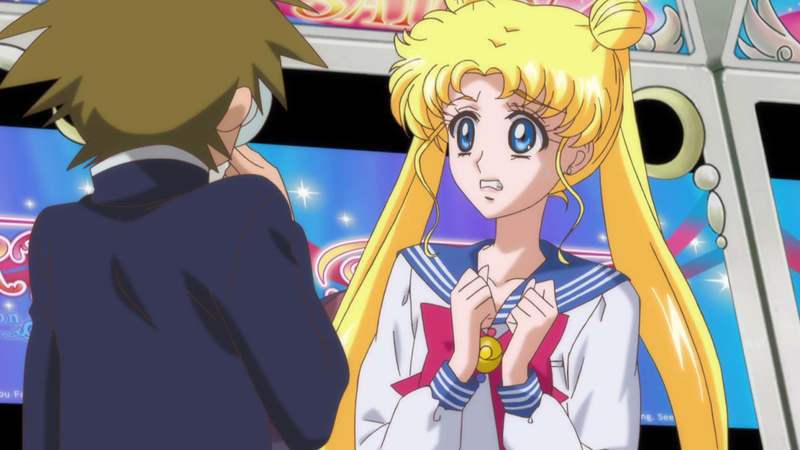 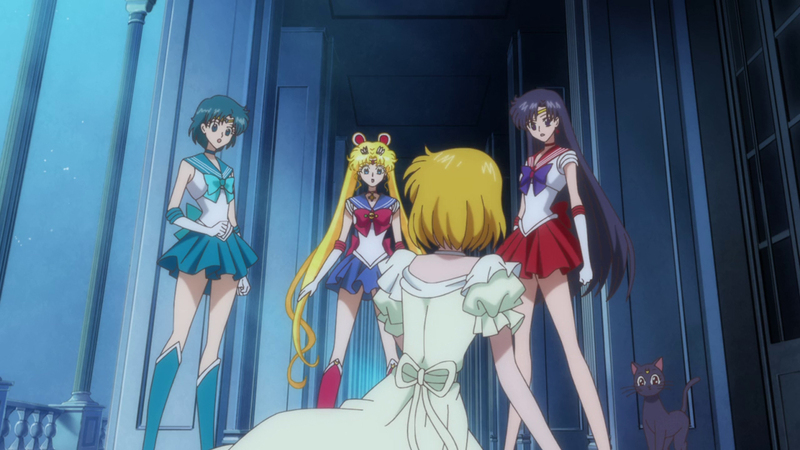 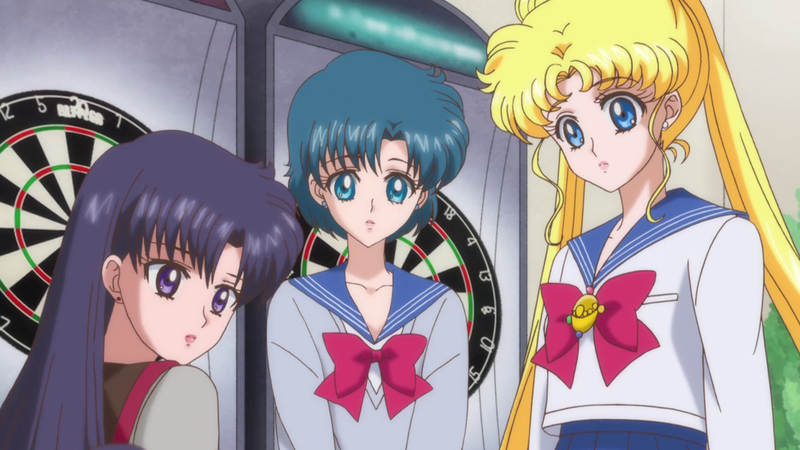 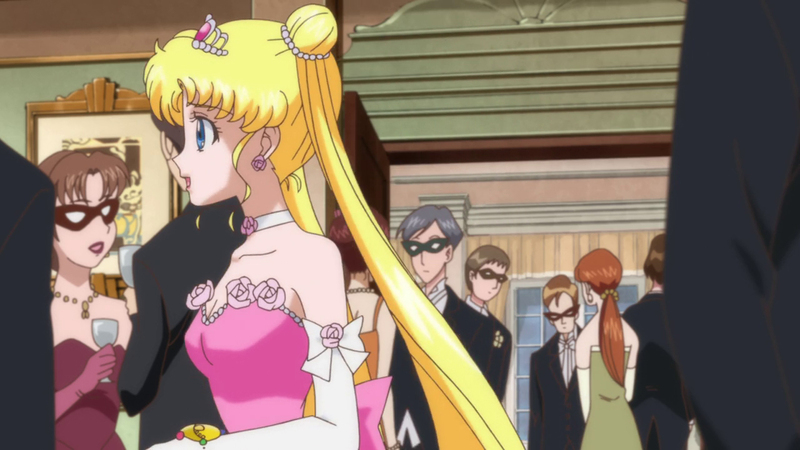 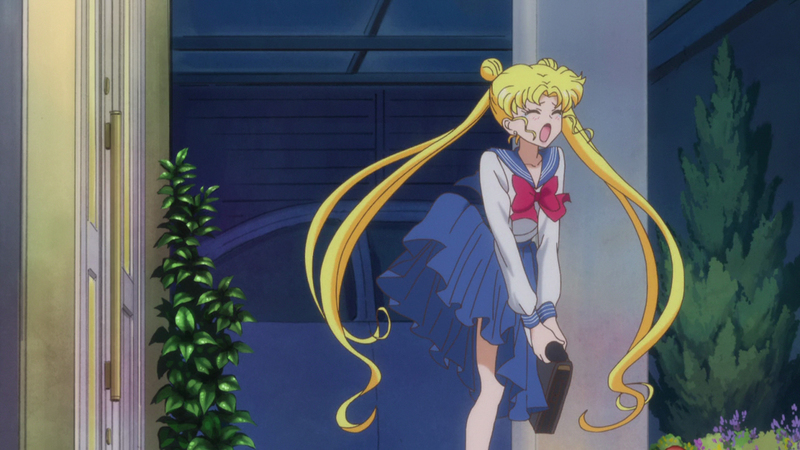 Usagi is missing her Disguise Pen during this scene. Usagi is missing her Disguise Pen. 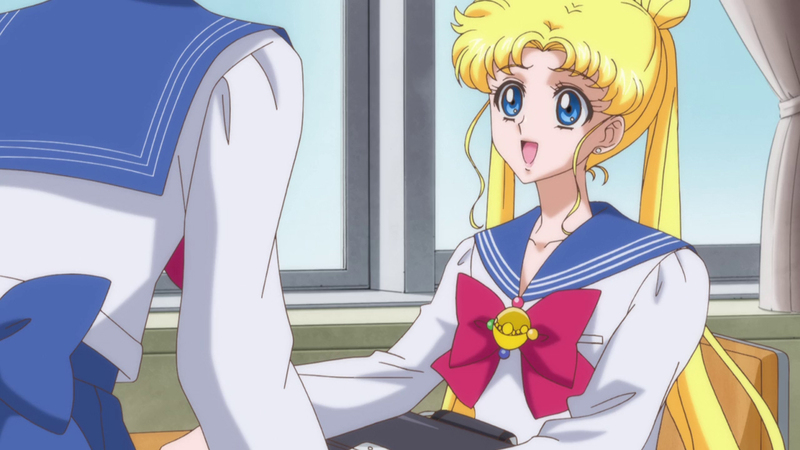 Usagi doesn't have a chest pocket (BD-only error), nor her Disguise Pen. Luna looks strange, and her walking animation is very bad. 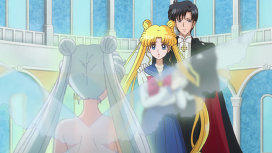 In two of the reflections, Luna is missing her eyes. 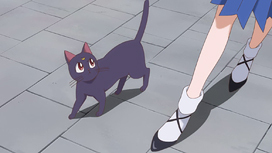 Her back collar keeps vanishing and reappearing. 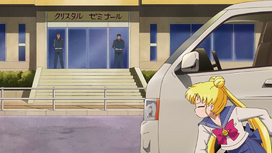 BD-only error. 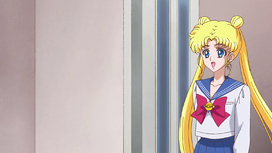 Both of her ears disappear during one frame. Her left ear briefly disappears during one frame as well. 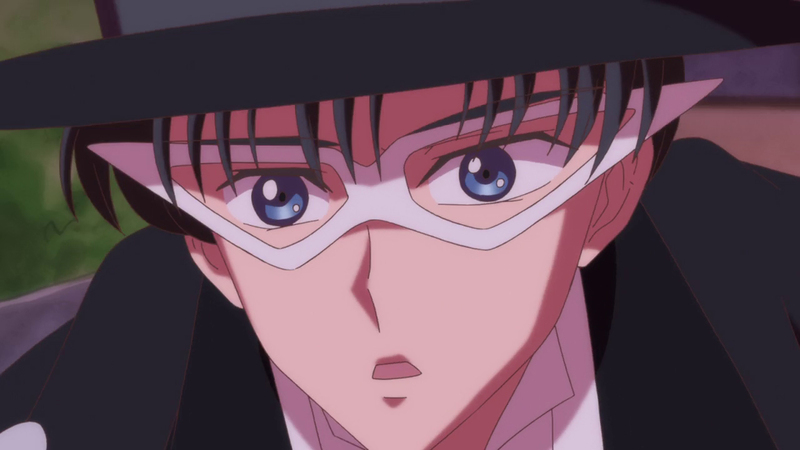 Tuxedo Mask's mask is completely filled in with skin color. 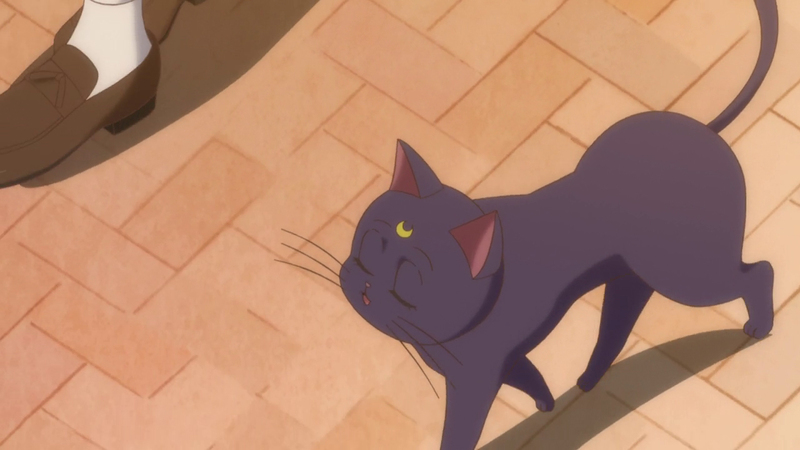 Luna is drawn and animated very strangely during this scene. 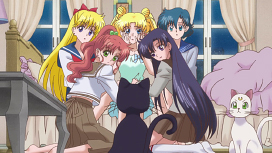 Luna is laying on the wrong side of Usagi's odango. 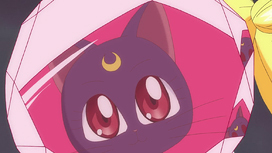 Luna is drawn and animated strangely. Luna's eyes have no whites. 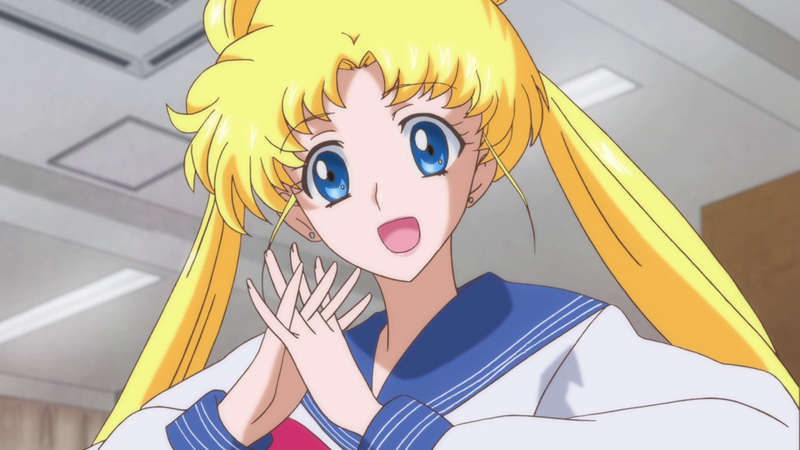 Usagi's hair acts more like cardboard than actual hair. 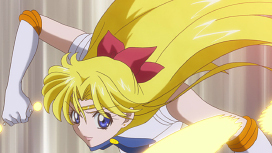 Despite barely moving, her left pigtail abruptly changes position. 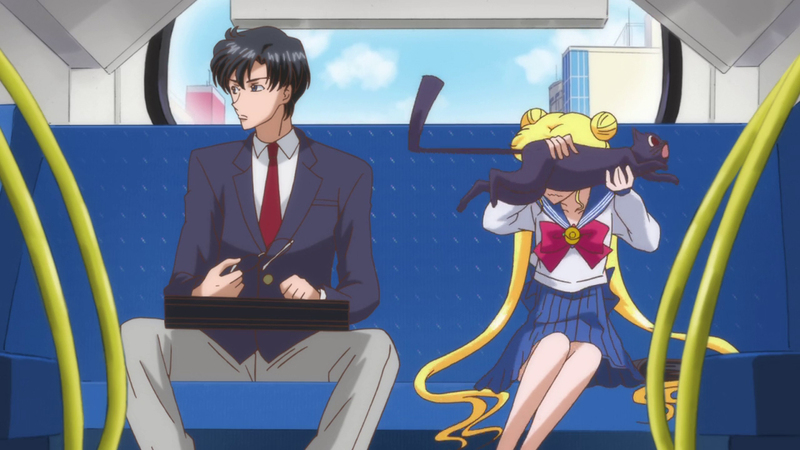 Usagi briefly misses her back bow. 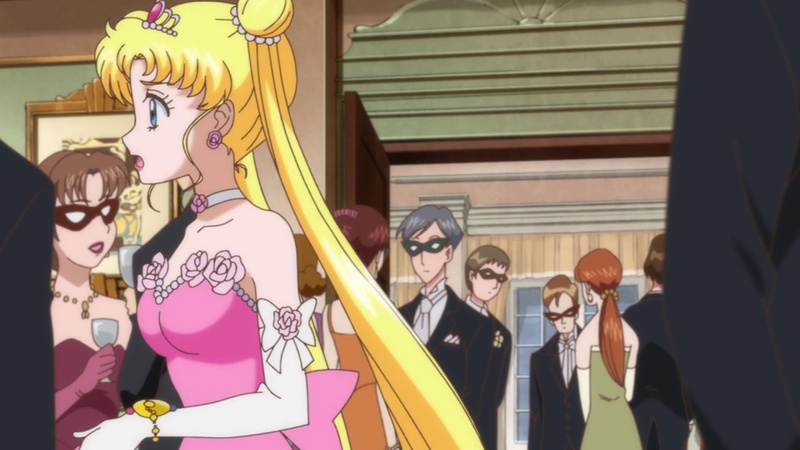 His mask is completely filled in with skin color. BD-only error. 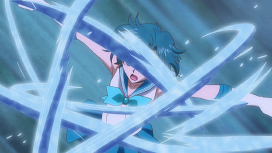 Sailor Mercury's back bow is mistakenly turned into a part of her skirt. Rei's right arm is broken. 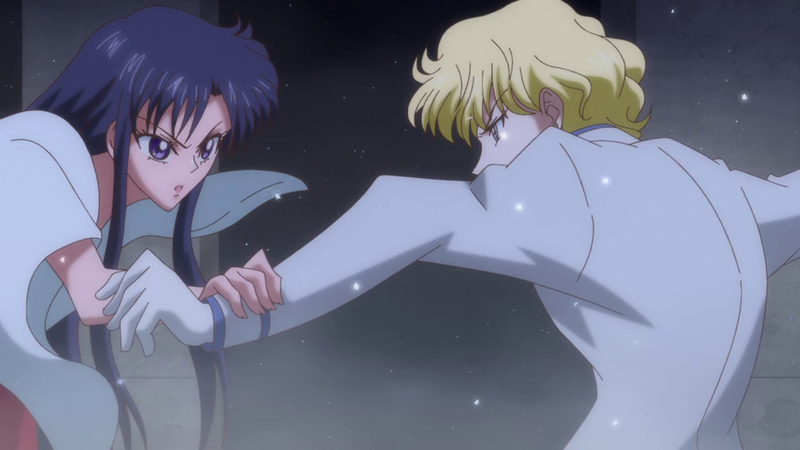 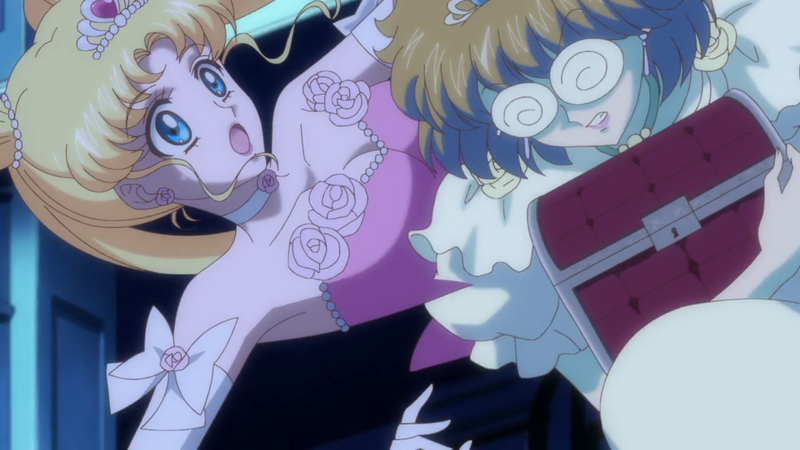 Jadeite's arm is broken, Rei's arm makes no sense, and her eyes are misaligned during this frame. Luna's tail briefly gains a strange shape. 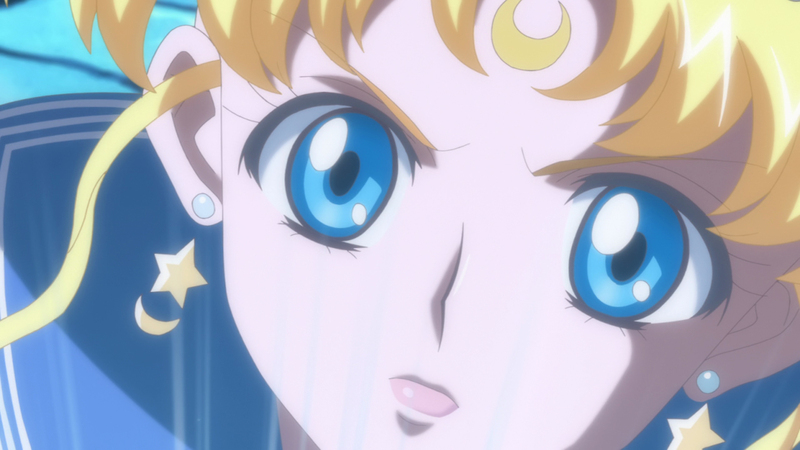 Her eyes are also wonky during this scene. BD-only error. 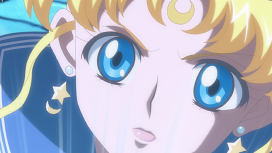 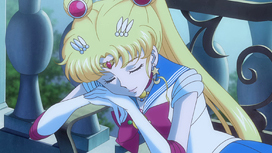 Sailor Moon is wearing the new tiara she recieves the next episode. 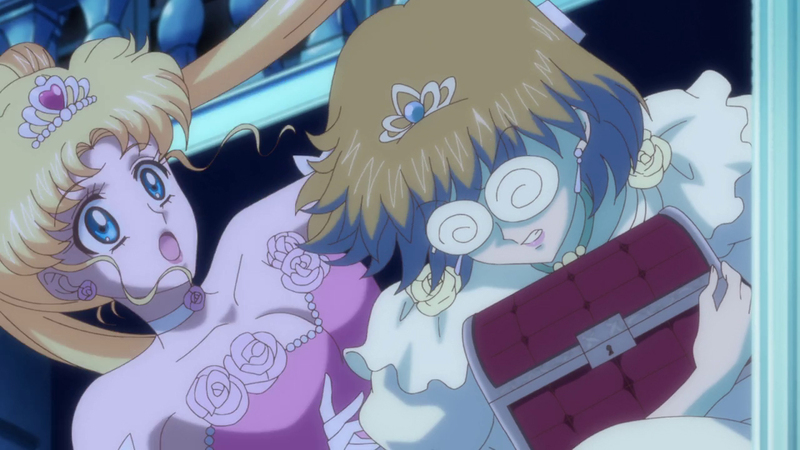 BD-only error. 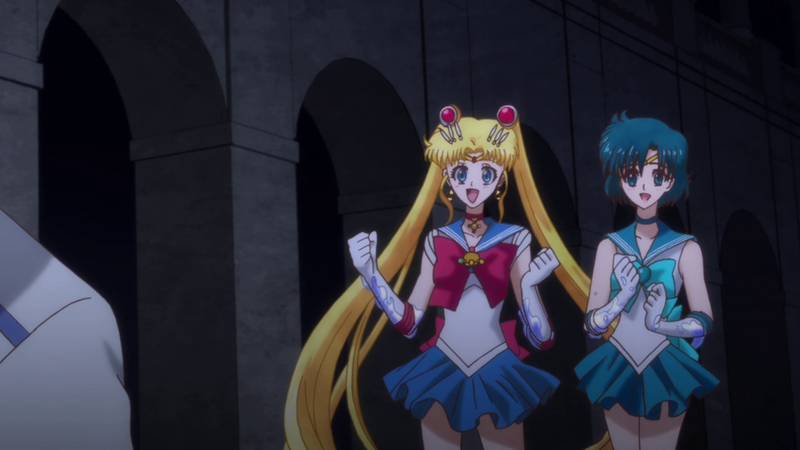 Sailor Moon and Mercury both have extremely thick arms. BD-only error. 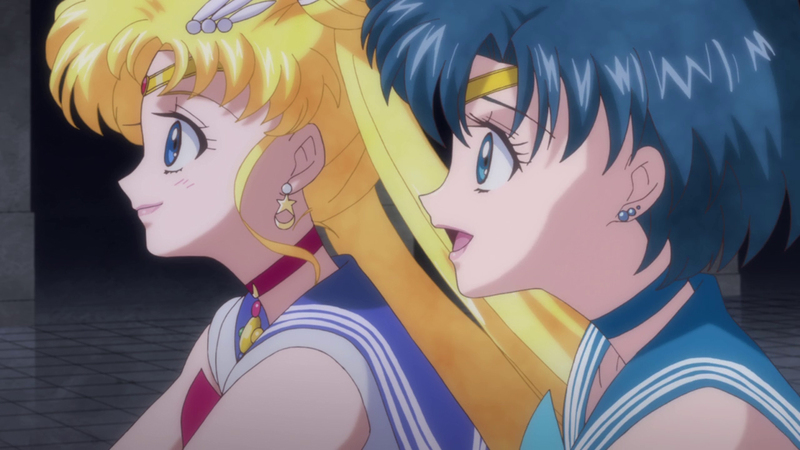 Sailor Moon is missing her back bow, and Mercury is missing a piece of her front bow and back bow. 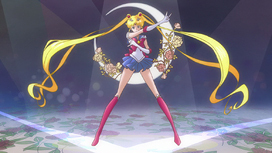 Her right arm is broken, and she's missing part of her back bow (BD-only error). Her left ear is supposed to show through the hair. 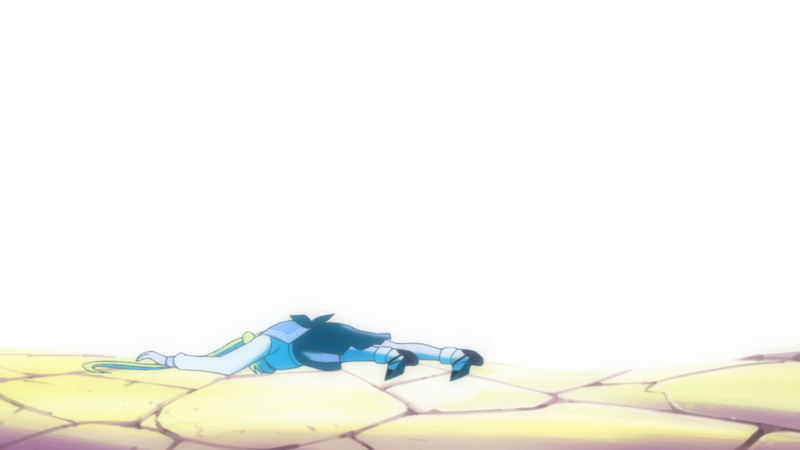 It appears a few frames later. 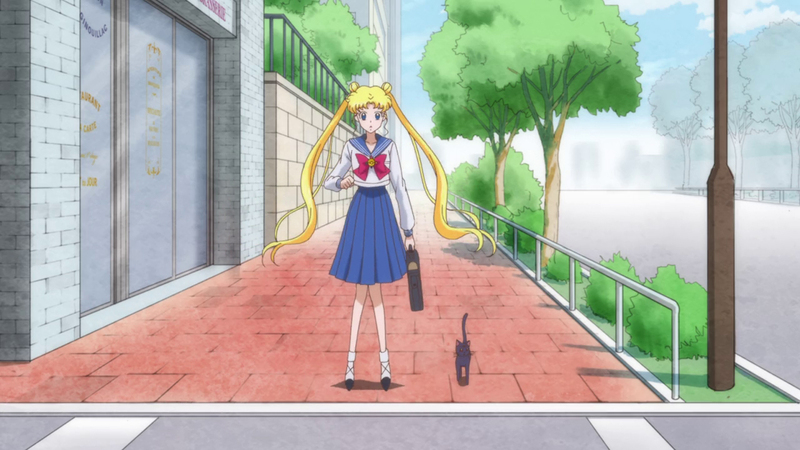 Usagi is missing the Disguise Pen in her pocket. 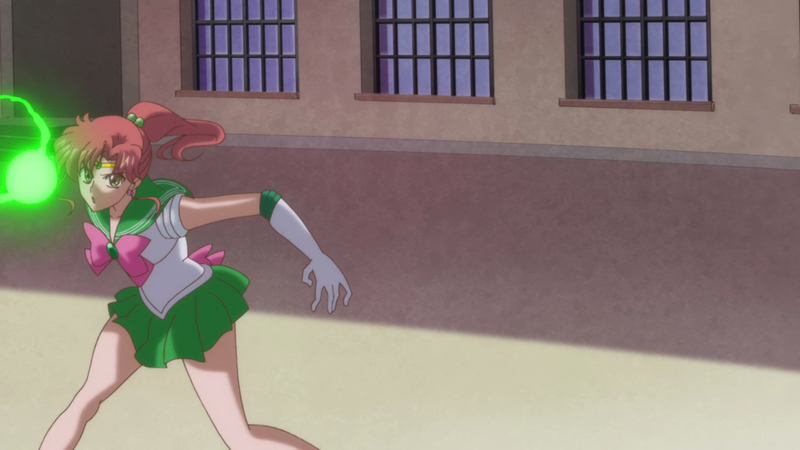 The Disguise Pen is gone for this entire running scene. 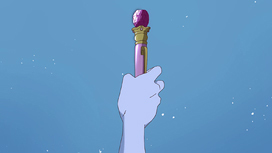 The Disguise Pen is still gone. 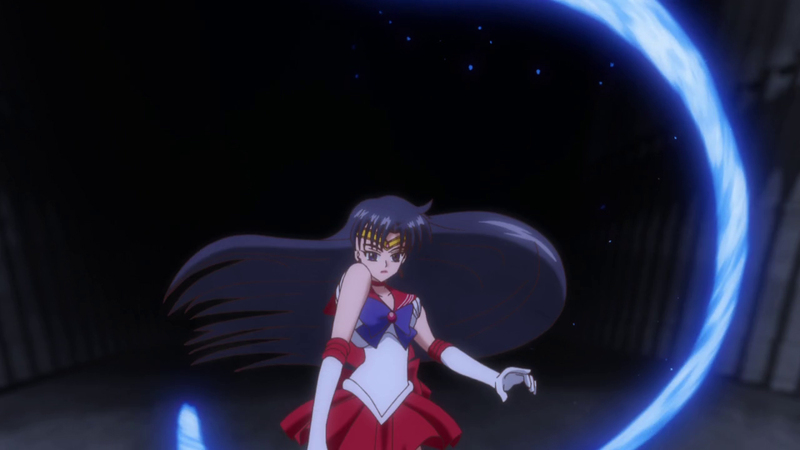 It will magically appear in the next scene. 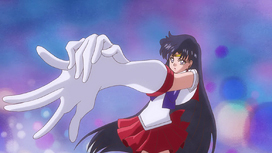 Her hands are drawn very strangely. When Usagi turns, her back ribbon vanishes. 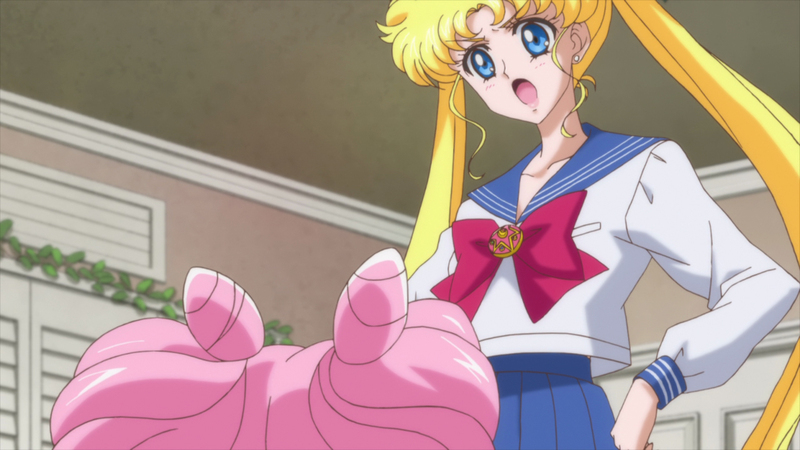 Usagi lost her Disguise Pen again. Usagi still haven't found her Disguise Pen. 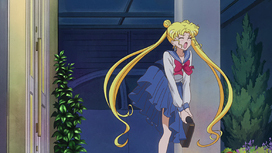 Usagi is missing her Disguise Pen. 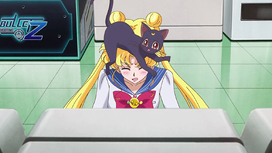 Also, Luna do not appear to actually be sitting on Usagi's head, as there is no sense of weight. 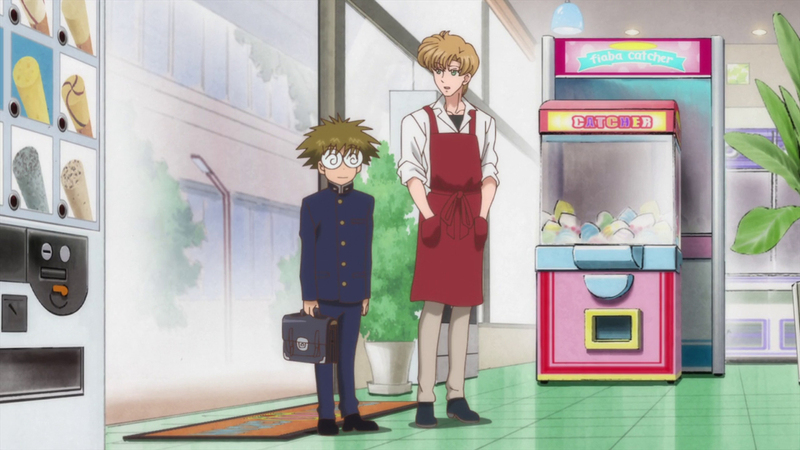 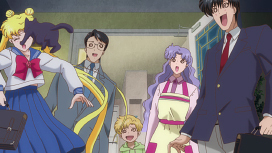 Motoki and Umino are suffering from bad anatomy. 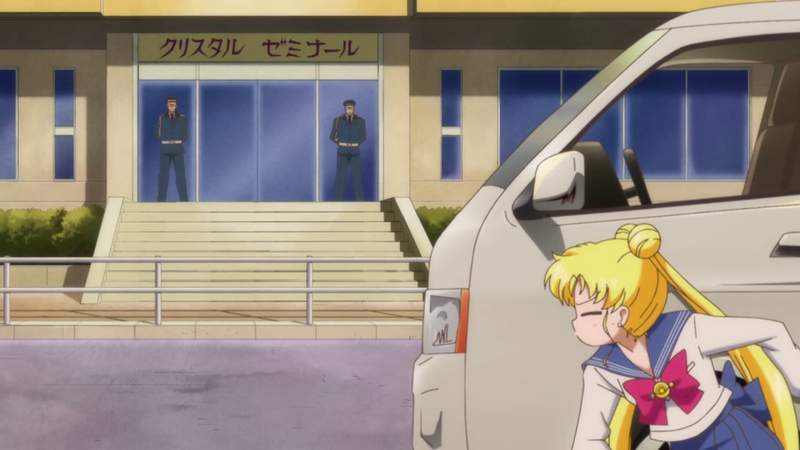 The Disguise Pen in Usagi's pocket is gone. Usagi's Disguise Pen is not in her pocket. 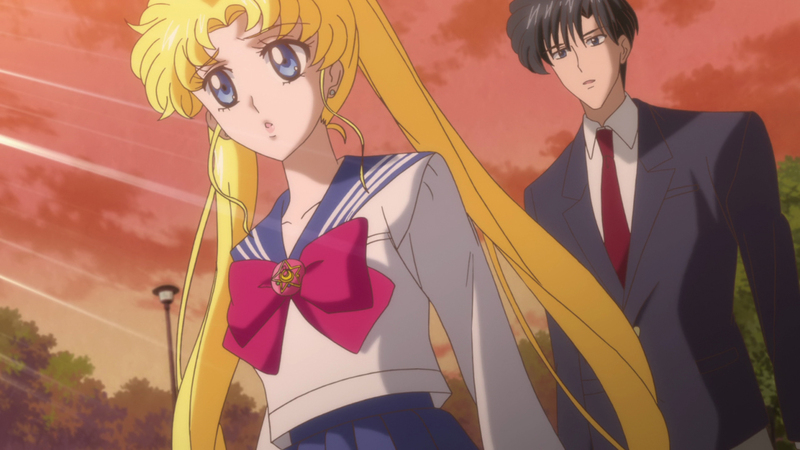 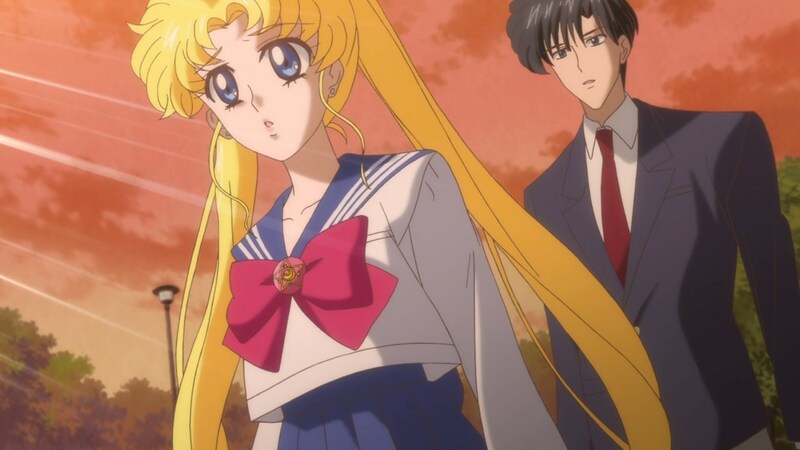 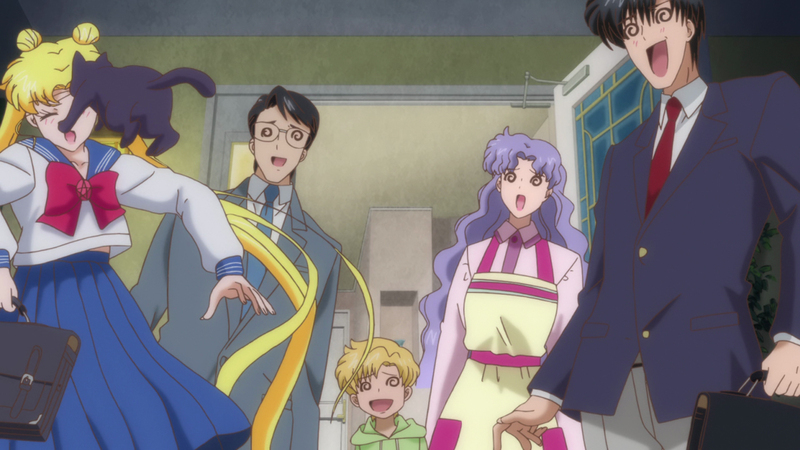 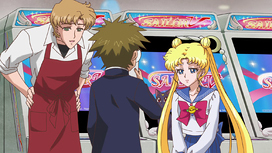 Motoki's anatomy is off and Usagi is missing her Disguise Pen. 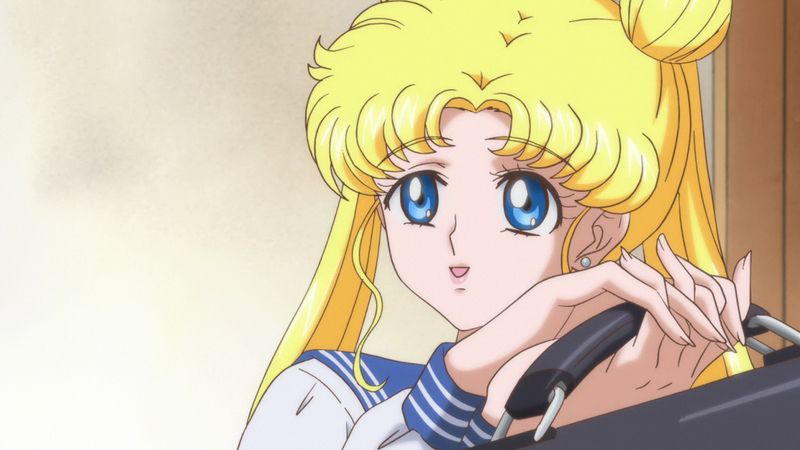 Usagi is missing her chest pocket and her Disguise Pen. 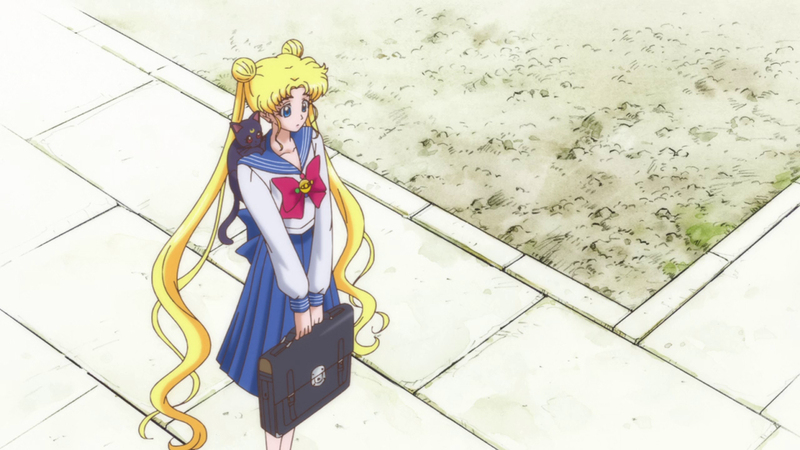 Usagi is missing her pocket and Disguise Pen again. 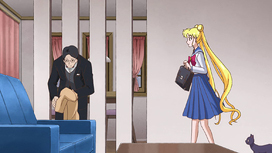 It will reappear in the next scene. 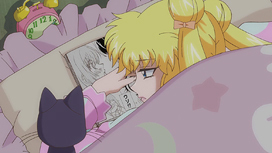 BD-only error. 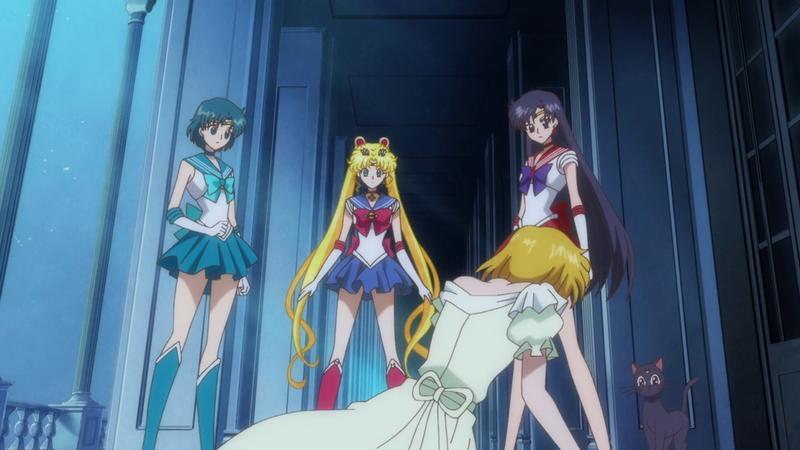 Usagi's back bow keeps vanishing and reappearing during this scene. 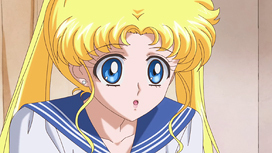 BD-only error. Usagi's back bow is colored yellow for one frame. 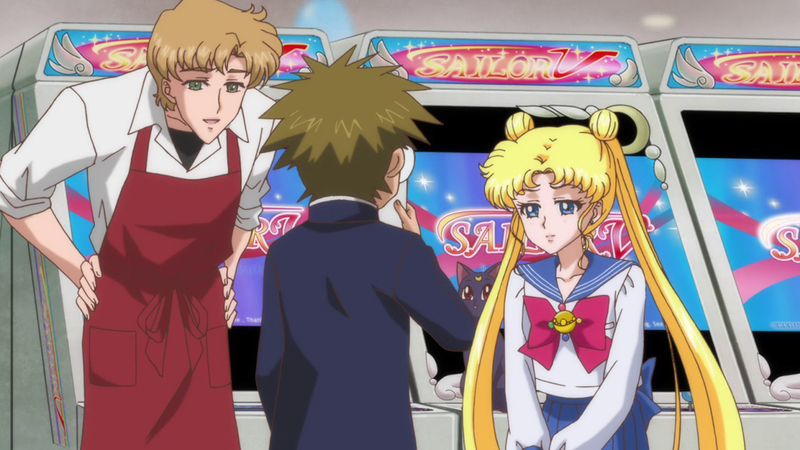 This scene has multiple errors. 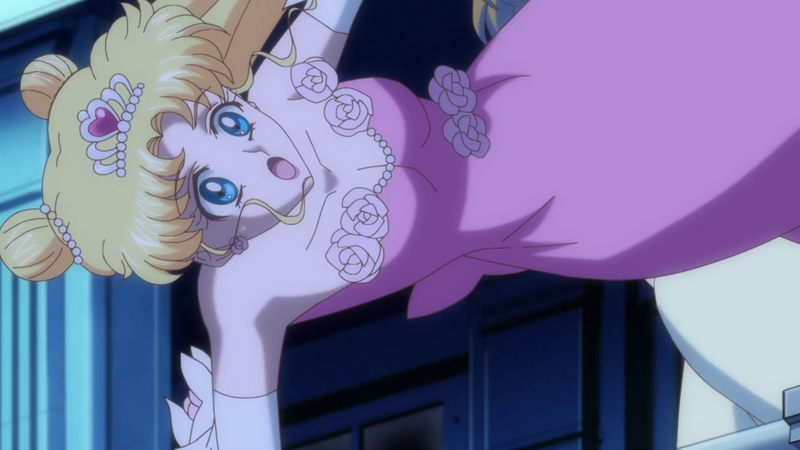 When Usagi falls down the balcony, she passes right through Princess D despite being knocked to the side. 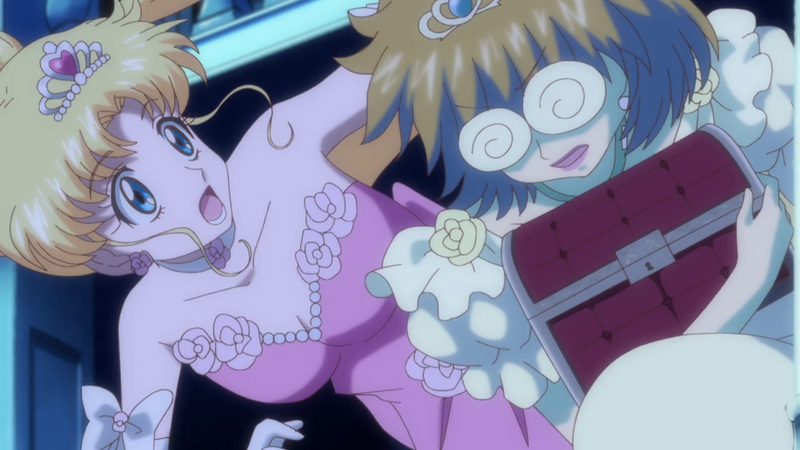 When she gets knocked away by Princess D, she moves back behind her again the next frame. 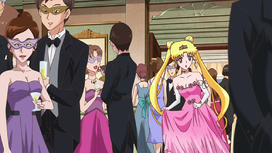 As she moves, one of her fingers gets cut off (BD-only error), and her dress will cut into Princess D's sleeve (BD-only error). 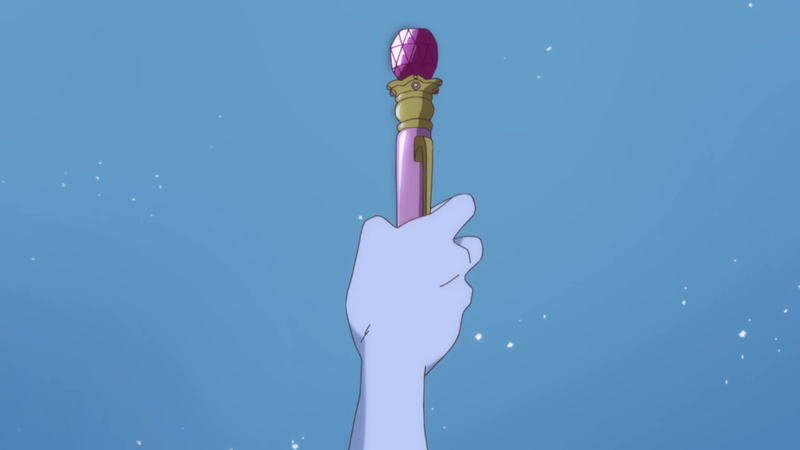 The Disguise Pen is huge and has a strange drop shadow. 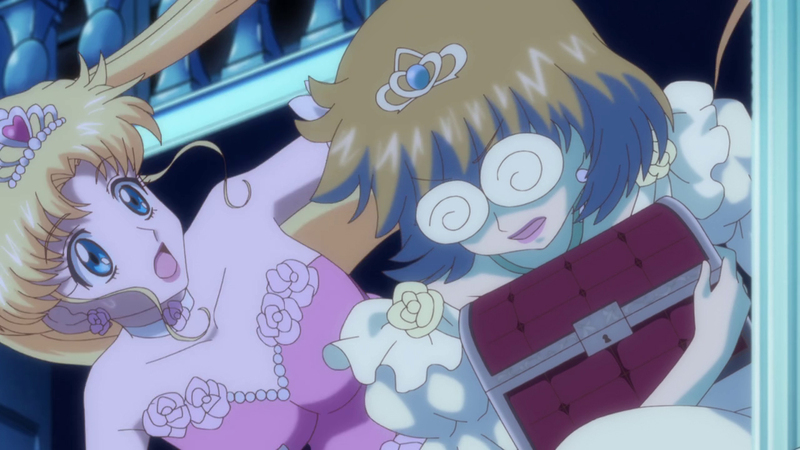 The bottom part also vanishes and reappears twice. 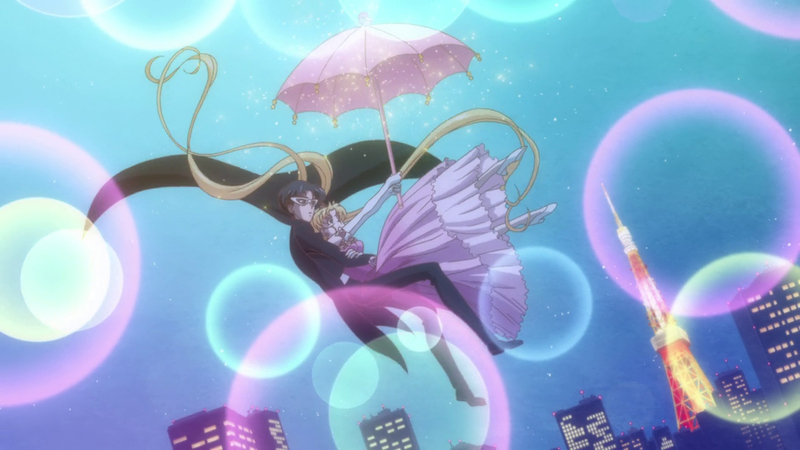 Tuxedo Mask's tailcoat is defying gravity. 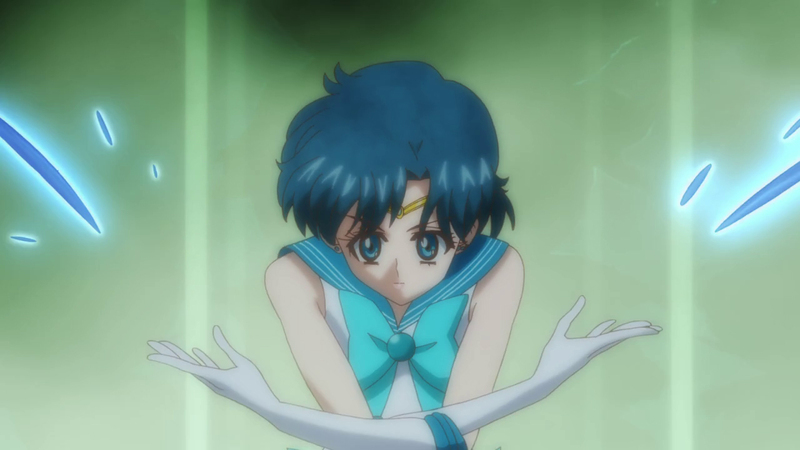 BD-only error. Sailor Moon is missing her back bow. 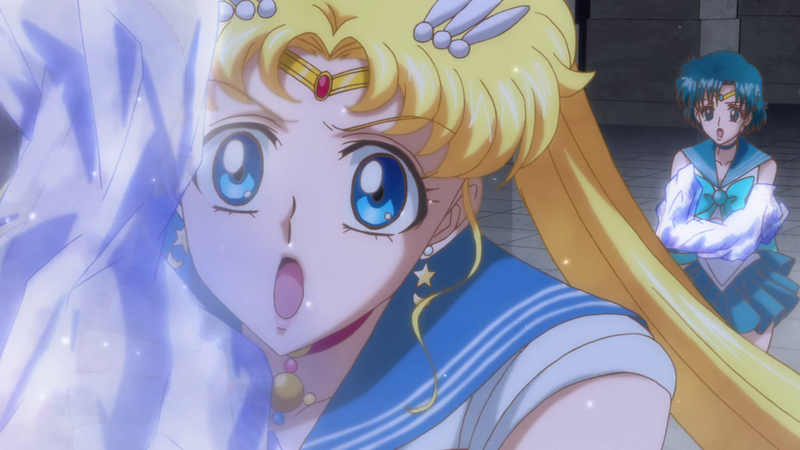 BD-only error. 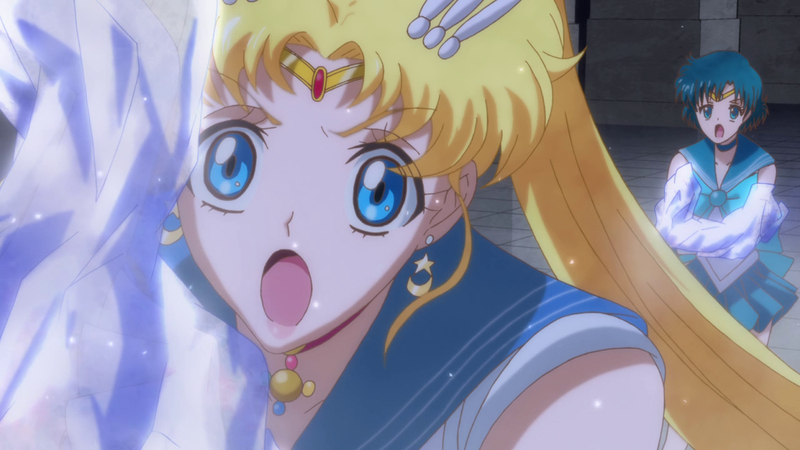 Sailor Moon's odangos grow in size as she moves her face slightly. She has a huge head. Makoto's ponytail is still whipping back and forth, despite them fixing it in the next scene. Her choker is missing. 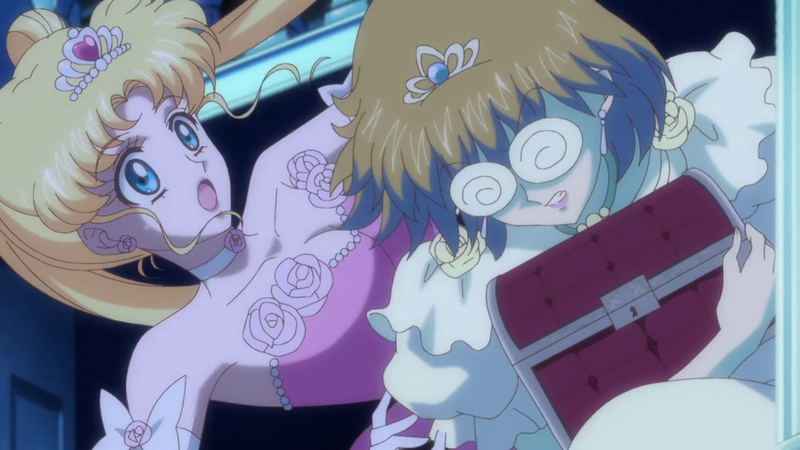 It appears again the next frame. 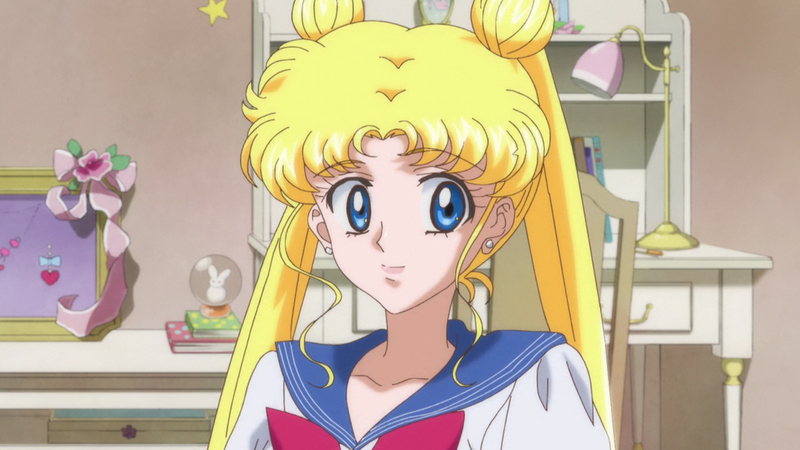 Her right hair strand is behind her ear instead of in front of it. 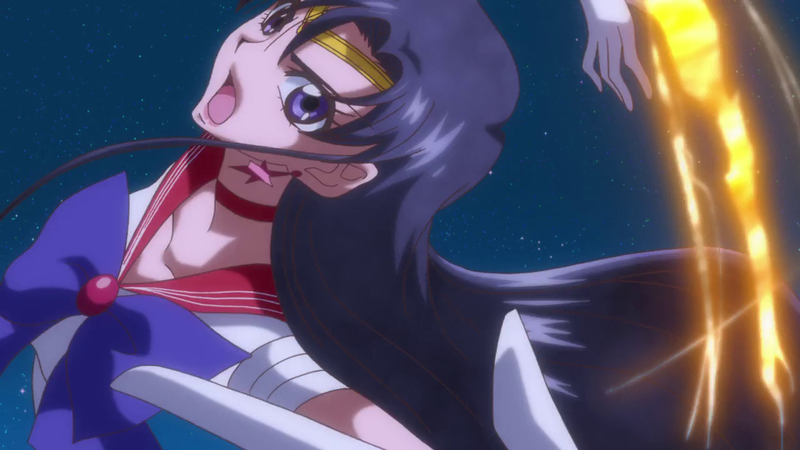 She doesn't have a back bow during this sequence. 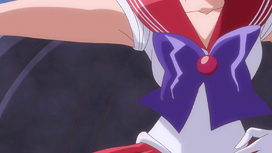 The back part of her collar vanishes for a number of frames. 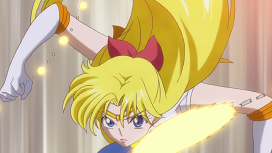 Her bow isn't fully colored in. 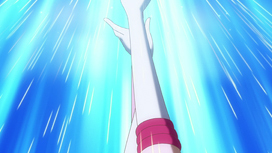 Her glove is white instead of red. She's missing the lower part of her body. 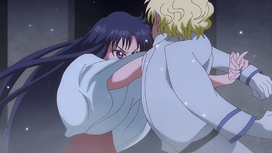 Her back bow will also disappear for the rest of the sequence. 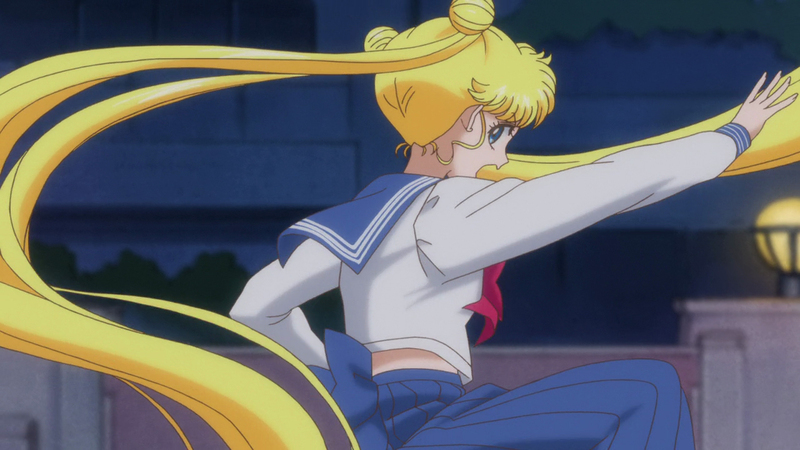 Her back bow is missing from the rest of the sequence. 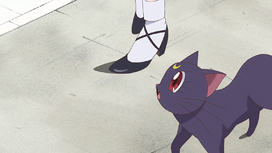 Part of her collar is white. Sailor Venus is missing her back bow. Sailor Mercury's character design doesn't have sleeves. 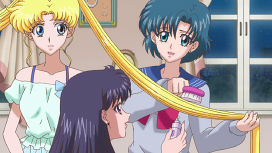 The part below Ami's bow is supposed to be white, not gray. During this scene, Ami doesn't actually hold the hair brush. 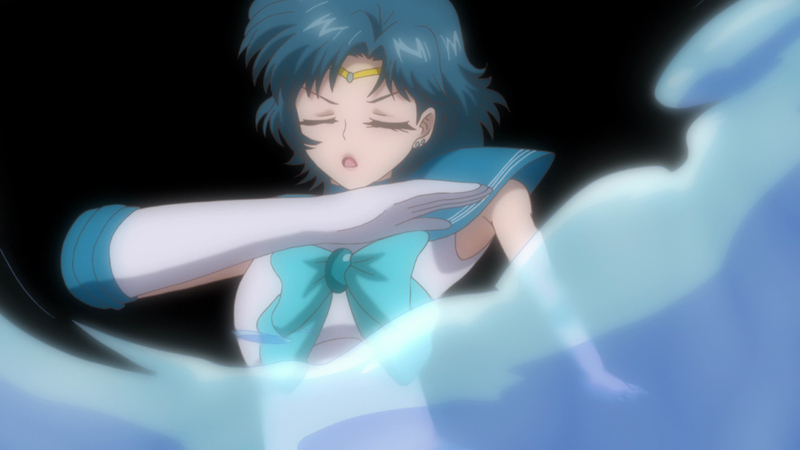 The brush floats in front of her closed hand. The red stripe is missing from Rei's collar. 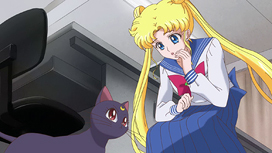 The white piece at the bottom of her collar is missing. 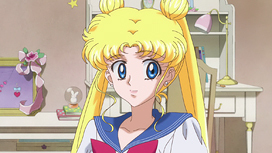 She has a strange skin-colored piece above her right ear. The Moon Stick is going behind her arm, despite the hand holding it being in front of the other arm. She's missing her choker for a few frames. Her brooch is also drawn incorrectly, and there are strange lines on her neck. Two of her hair pins are colored yellow instead of white. She's missing the second piece of her choker. Usagi's anatomy is highly incorrect. 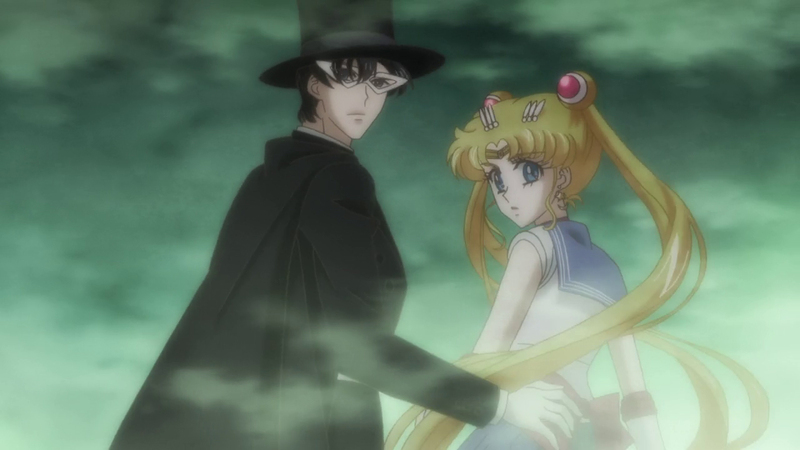 Tuxedo Mask is missing the red band on his collar. Calaveras' chest piece is drawn incorrectly. BD-only error. 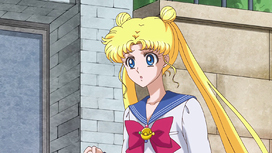 Usagi is missing her back bow. 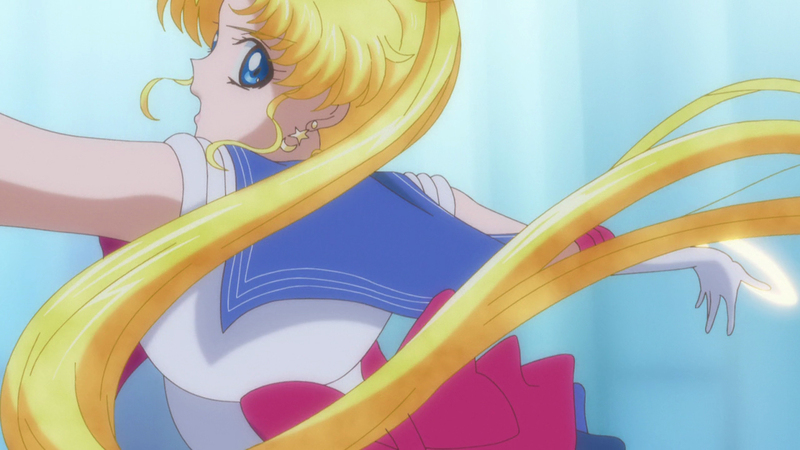 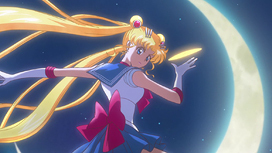 Usagi's back bow disappears and appears again during this sequence. Usagi is missing her back bow. 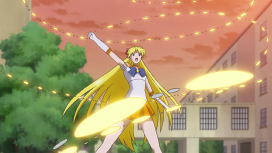 Her choker is drawn but not colored. 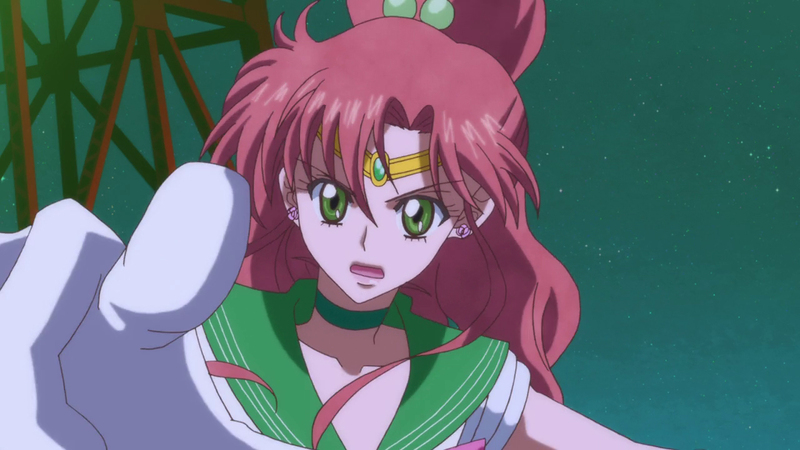 Her collar is colored the same as her hair. 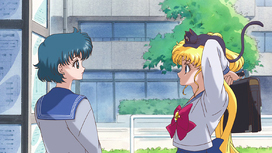 The right side of her collar is colored the same as her hair, and the left side is left white. 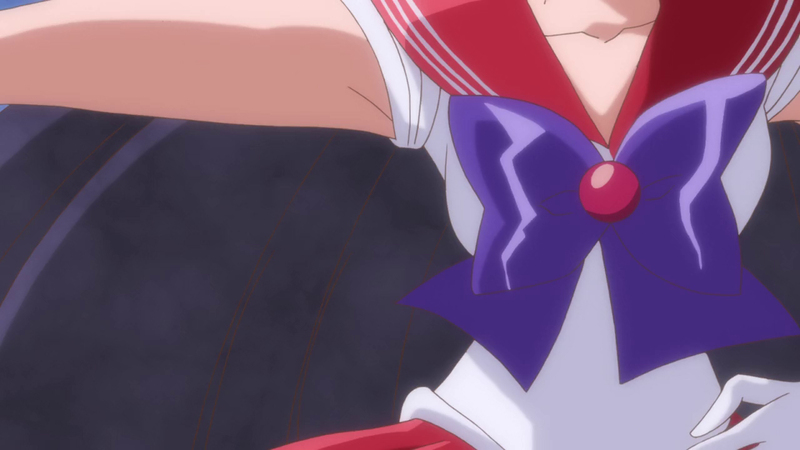 Her back bow is gone. 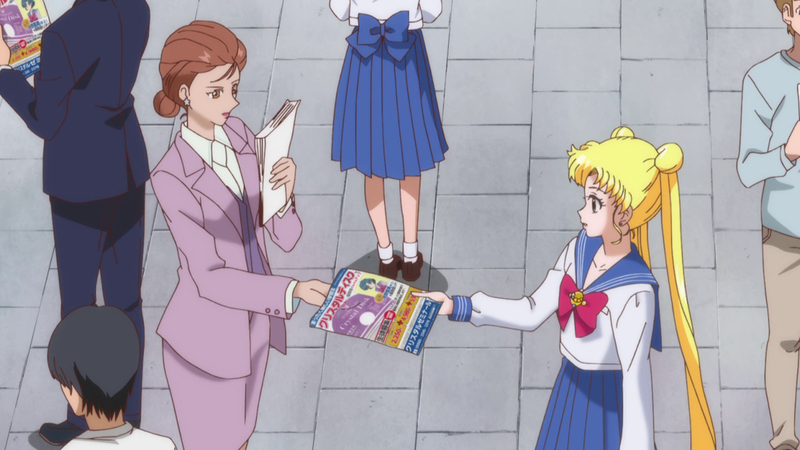 Her back bow is gone again. 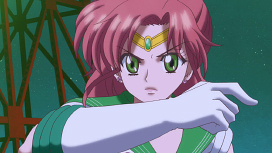 AI-NO-SENSHI © 2008-2019 LINDA, ALL RIGHTS RESERVED. BISHOUJO SENSHI SAILOR MOON © NAOKO TAKEUCHI.